If you are bringing your brick and mortar store online or planning to launch an eCommerce store, having a marketing strategy in place would increase your chances of success. Today, many businesses evolving by ramping up their digital presence. The introduction of easy-to-use eCommerce platforms such as Shopify, Magento, Woocommerce, combined with the power of social media and the advancement of search engine technology have only made going digital the most obvious option for any businesses looking for a competitive edge. In this article, let’s take a look at organic Search Engine Optimisation (SEO) and discuss the benefits of it. Ads are a rather costly way to increase website traffic and sales. However, with the help of SEO, you can leverage, grow, and multiply your online business all without splashing your budget on ads. Need more convincing to focus on SEO marketing for your business? Here are 5 top reasons why you need SEO marketing for your business in 2019 and beyond. Did you know that Facebook made more than $40 billion in revenue in 2017, and about 89 percent of that came from digital advertisements? That signifies two things. One, there’s a lot more competitors bidding on this auction-based ads platform. Two, the costs of running effective ads are climbing. In this case, you do not always get what you pay for. You will need to carefully segment and target your audiences to better optimise your ad budget, otherwise your cost per acquisition will go up significantly and lower your profit margin. How Facebook ads – like most ads platforms work – is by an auction-based bidding system. The highest bidder is the winner. On Facebook ads manager, you are able to put an ads budget on how much you’re willing to pay (in a day or lifetime of the campaign). Facebook ads became much less effective starting from the 2nd quarter of 2017 where the advent of the eCommerce spearheaded by Amazon’s CEO, Jeff Bezos, caused a spike uptrend of eCommerce sites popping up left and right. These sites then use advertising platforms such as Facebook, Instagram and Google Ads which in turn causes massive amounts of competition leading up to 2019 this year. Since advertising platforms are mostly auction-based, it depends on the budget that you have to spend and because of this smaller-scaled business owners aren’t able to compete with big companies’ exorbitant marketing budgets. Thus, smaller-scaled owners compete with a ton of other small-scaled owners, making advertising much less effective than the years before 2017. Outdoor, print, and guerrilla marketing and physical advertising aren’t cheap either – I’m talking about 5-figure costs for a static ad. The estimated cost to put up wall scapes at four locations for one month would be around $39,000. As for having your ads on train stations, cost ranges from $54,500 to $61,500 per month depending on which station it’s displayed at. These prices are in 2017 to 2018, and following the trend of ads cost, costs will only increase in the future. Comparing paid ads (digital and physical) with SEO, the latter wins in terms of cost for sure. Short-term strategy is not a bad thing compared to long-term strategy. It is important to have both of them so that you can sustain your business presently and in the future. SEO is great for long-term strategy and ensuring sustainability because when you’ve built your website’s SEO well, traffic will still come in even when you don’t do anything for that day or two. Compared to ads, there’s a constant need for output to have input. The bottom line of every business is the to get more sales with a cost-effective marketing strategy. Relying on paid ads alone is unwise because competition is getting greater. With an SEO strategy and efforts in operation, you have another channel of website traffic without needing to compete with companies of bigger budgets or pay to get your brand seen. 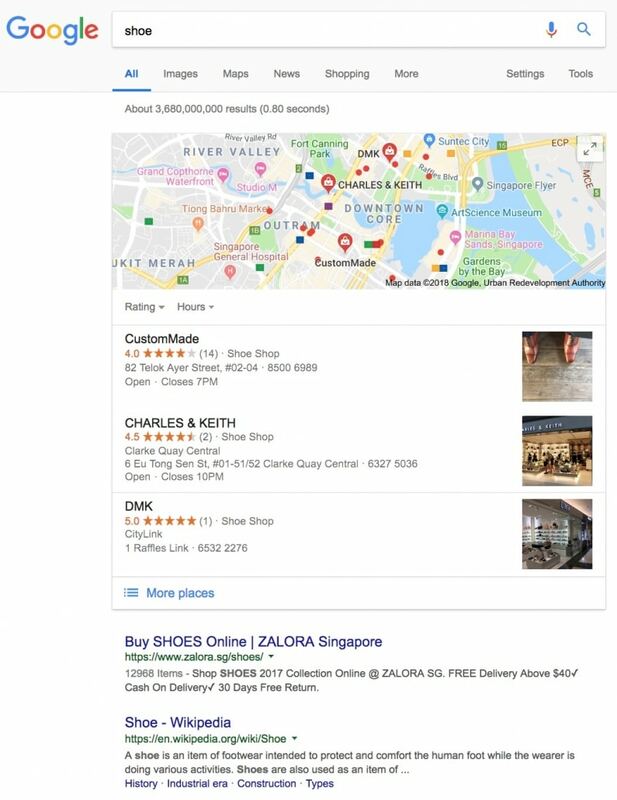 For example, when you search for ‘gym clothes for sale singapore’, you’ll see some organic search results (picture on left), and paid ads search results (picture on right). The example on the left shows up on the first page on Google for free whereas the example on the right paid for those spots. The left one gets website traffic for free whereas the right one pays for every click it gets. Even if someone doesn’t actually buy something from the site, they have to pay for that click. Clearly, getting free organic traffic is better than paying for it. Based on a Smart Insights report, 2.5% is an average conversion rate. Therefore, it is relatively safe to assume that for every 1000 additional visitors you receive, thanks to your SEO strategy, 25-30 new customers may emerge. Return on Investment (ROI) here would be exceedingly great. 51% of all website traffic comes from organic search according to Bright Edge. By improving your SEO, it’ll mean more traffic to your website. Based on the stats above, more traffic means more sales likely to occur. Ads are literally digital versions of salespeople who approach you near the train stations. You feel disturbed, interrupted, and most of the time – you ignore them. It is worlds apart as compared to you choosing to go into a boutique or picking up the phone to call in air-conditioning servicing. The state of mind the consumer would be in when he/she searches for something, your website shows up on Google, and they voluntarily click on it is the key difference here. According to Think with Google, 39% of purchases made were influenced by a relevant Google search. It is much easier to convert people who are searching for you instead of you trying to search and sell to them. Remember, people don’t like to be sold to but they like to buy things. Good online presence simply means that you can be found for the things you want to be found for. In a study done by HubSpot in 2018, they found out that 61% of marketers say improving SEO and growing their organic presence is their top inbound marketing priority. For example, you’re a business owner of a Muay Thai Gym in Singapore. You want people who are entering search terms such as Muay Thai Training; Muay Thai Gym in Singapore; Martial Arts Singapore to find you. Optimising your website’s SEO can help you build a strong presence online for such relevant searches on top of other marketing efforts. Improving your online presence would not be dependent on a sole platform or stream. Combine SEO, paid ads, social media, and interacting with targeted communities can help your eCommerce business be more known in our big, big internet world. In summary, SEO marketing can help your business to saves cost on ads, both physical and digital, help your business be sustainable in the long-term, increase your sales and revenue, bring customers to you instead of you going to them, and boost your online presence. With these five reasons, I’m sure that you’re excited and ready to start working on your SEO. 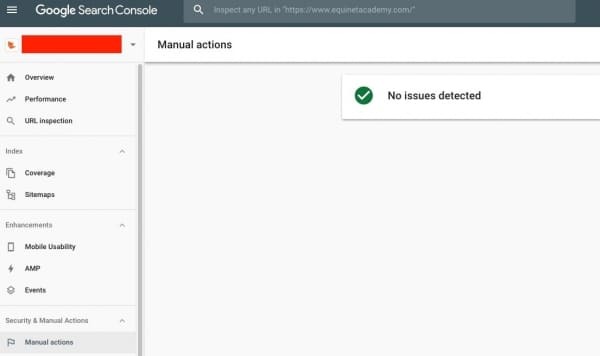 If you would like to learn exactly how you can get started, check out Equinet Academy’s WSQ SEO course here. Jamie is the Co-Founder of Digital Alpha Agency where they specialise in helping health and fitness businesses grow with strategic digital marketing solutions. She enjoys hitting the gym and exercising on a daily basis. SEO services are in high demand in Singapore, with over 480 and 720 monthly searches for the terms “seo agency” and “seo services” respectively. If you add “seo agency singapore” and “seo services singapore” to the list, you’re looking at a whopping 35,040 searches a year on average (as of the date of this post). With the huge and growing demand in the SEO services industry, let’s explore what an SEO agency does and whether you should hire one for your business. An SEO agency typically starts off with an SEO audit of your website. This is done to see where you’re standing in terms of your website’s ranking position on Google. The good ones will also take the extra effort to learn more about your business and marketing objectives in order to recommend the best plan of action i.e. prioritise optimising for keywords with the highest returns on investment (ROI). 3. Off-page SEO audit – to check your domain authority, quality vs quantity and diversity of backlinks, any low-hanging fruits, bad backlinks that could result in a penalty, etc. They will then propose a set of keywords you should focus on optimising your website for. Depending on how large your website is, the entire project fee may vary from a couple thousand to tens of thousands and the duration of the contract may span from 6 months to a year. This is what SEO agencies are expected to be doing. 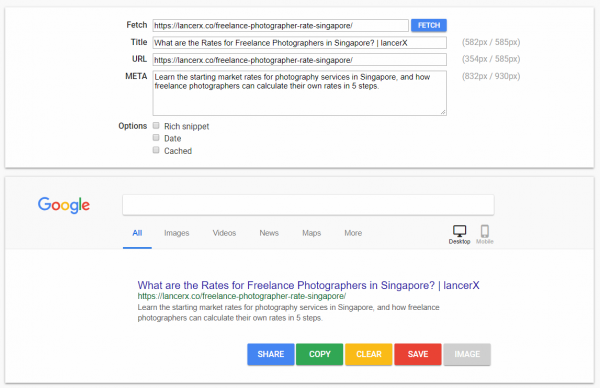 But while many SEO agencies in Singapore claim they are white-hat, many do completely the opposite of what is stated in Google’s Webmaster Guidelines. A past SEO course participant’s website I audited showed evidence of their SEO company embedding a hyperlink (backlink) to another of their client’s website. This was done without client A’s consent in efforts of ranking client B. What’s worse was that they used Cascading Style Sheets (CSS) to push the backlink 5000 pixels off the screen. Meaning it wouldn’t be visible to the user’s browser, but Google would be able to detect the link. You will come across SEO agencies in Singapore who guarantee number one rankings or your money back. These agencies usually engage in shady link building methods such as harvesting link farms or private blog networks that could potentially get your website penalised by Google. i.e. removed entirely from the search engine results pages. Here’s an example of a shady backlink from a private blog intended to increase Google rankings for their target keywords. The words in red are exact-match anchor text promotional backlinks which, when clicked on, links to the following shopping page. Totally against Google’s Link Schemes. I’ve seen many cases where SEO agencies and consultants had failed to deliver their milestones they had promised after securing the deal. Even I have been guilty of this, due to sudden increases in workload and lack of manpower resources. As such, it is better to take your SEO campaigns in house if SEO is one of your highest ROI marketing channels. 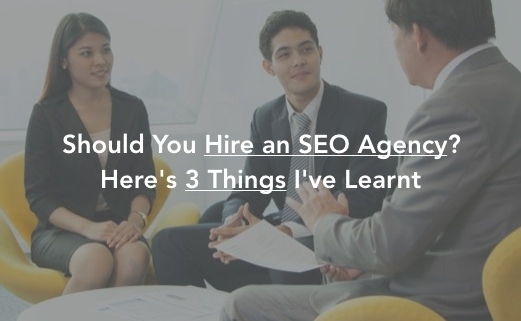 Should You Hire an SEO Agency? If you’re referring to the typical SEO agency that guarantees you number rankings yet refuses to be transparent with what they’re doing behind the scenes, then no. But if you’re strapped on budget for manpower resources and have trouble finding an SEO specialist with the relevant technical and creative skills, it may be better outsource your on-page SEO campaigns to a reputable digital marketing agency. My advice would be to leave your off-page SEO strategies to your in-house content marketing and marketing communications team to handle your link building campaigns or engage a content marketing and PR agency. If you’re about to hire an SEO company or still considering what to do with your marketing budget at this point, here are 4 things you can consider doing in the meantime. Doing SEO for a website isn’t as easy as “writing an article and praying that Google picks it up”. Instead, a lot goes on behind the scenes to help content rank on search engine results pages (i.e. SERPs). For example, this involves keyword research, structuring your content in a certain way, getting backlinks, etc. However, if you had to pay to do all these, you may end up burning a big hole in your pocket. Fortunately, you can find many online tools offering these features for free. That’s right – zero dollars. Zilch. Nada. In this article, I’ll be discussing 13 useful SEO tools that are completely free. Whether you’re new to SEO or a seasoned digital marketer, chances are you’ll find some of these free SEO tools handy for supplementing your SEO practices. By itself, the WordPress content management system already allows for the building of SEO-friendly websites. But you can take your WordPress website’s SEO to the next level by installing Yoast SEO. Yoast has over 5 million active installations as of writing, which only proves the popularity of this plugin. A close contender to Yoast SEO is All in One SEO Pack. It offers pretty much the same features as Yoast, and there are constant debates over which is the better WordPress SEO plugin. Having used both, I like All in One’s cleaner interface and ability to toggle certain features on/off as and when you need them. And unlike Yoast, All in One allows you to bulk edit SEO titles and meta descriptions from your Posts/Pages page. However, All in One doesn’t offer Yoast’s content readability analysis or breadcrumbs navigation features. That said, both plugins do a good job of optimising your site, and I would say which you use doesn’t matter that much. Just choose one and stick with it. 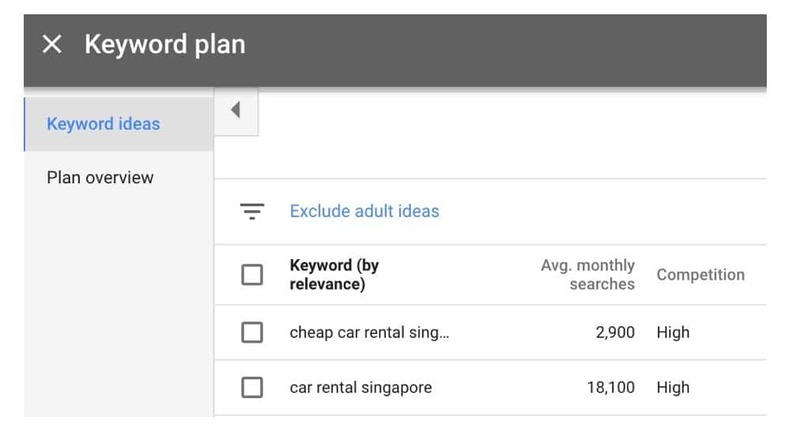 Google Keyword Planner is located within the Google Ads platform, and generates keyword ideas based on your target keyword(s). It shows the monthly search traffic estimates for all these keywords and how much people are bidding to advertise on them. With these insights, you’ll be able to gauge the popularity and competitiveness of keywords that you intend to rank for. You can also use your chosen keywords to run ad campaigns within the Google Ads platform. If you want to learn how, Equinet Academy is a great place to do so! Read my review of Equinet Academy’s Google Ads Fundamentals course for more info. 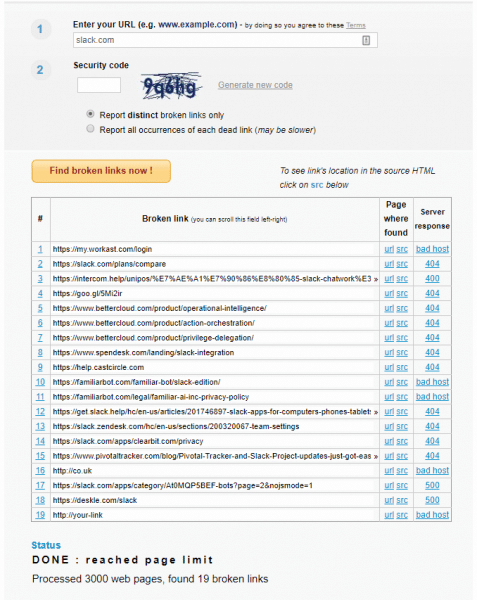 Check which websites are pointing to your website, or conduct an analysis of your competitors’ backlinks, using the free version of Ahrefs’ Backlink Checker. 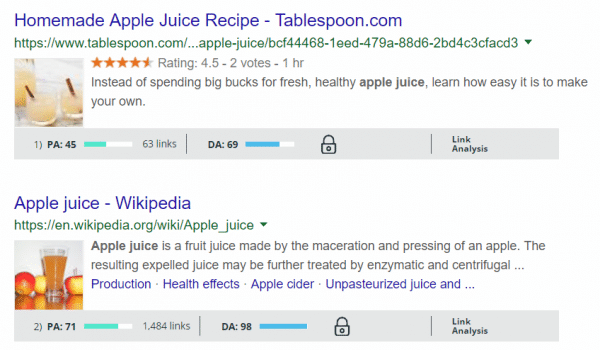 You can also drill down into the details of that URL or domain’s top 100 backlinks, top 5 anchor texts and – for domains only – top 5 pages with backlinks. The MozBar Chrome extension allows you to check the Domain Authority and Page Authority of webpages currently ranking for certain keywords. This is useful for assessing how easy or difficult it might be for you to rank for those keywords yourself. Click on “Link Analysis” for deeper analysis of these pages’ competitiveness in Moz’s Link Explorer. For example, you can view their backlinks and the number of keywords that they rank for in Google. To use MozBar, you’ll need to sign up for a free Moz Community account. There is also a cap of 10 free uses of Link Explorer every month. Having article content that is scannable and easily understood will keep users reading your content for longer. This helps increase engagement with your content and reduce your bounce rate, among other benefits. 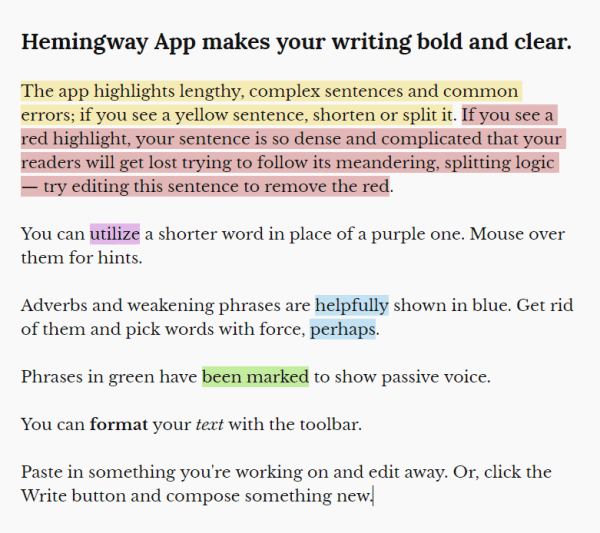 To check the readability of your content, try pasting it into the Hemingway Editor. It highlights issues in your writing and recommends improvements. For example, you may need to shorten sentences that are too long, or simplify your wording. With SERPsim, you can preview how your articles’ SERP snippets will look like in the Google SERPs. Previews for both desktop and mobile devices are available. This is handy for checking whether your article titles and meta descriptions fit within the Google snippet container. Compared to other SERP snippet simulators, I prefer SERPsim as it presents the container limits in pixels instead of characters. This allows for more accurate optimisation of your SERP snippets, given how Google uses pixel widths instead of character counts to determine how much of your descriptions to show. BrowSEO breaks down your webpage contents according to how Google understands it, ignoring all fancy stylings that your webpage might have. From here, you’ll be able to check whether Google is reading your webpage in the way you intended. 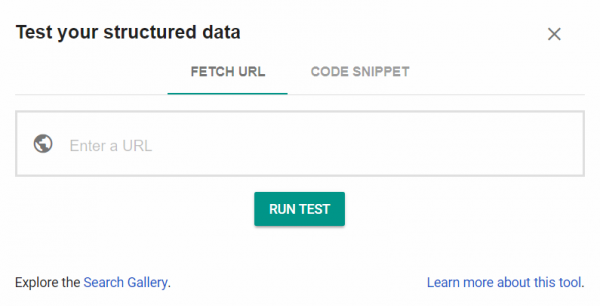 After adding structured data to your website, you can check if it’s correctly implemented using Google’s Structured Data Testing Tool. To do so, simply paste your webpage URL or code snippet into the tool. The Structured Data Testing Tool then returns a list of the structured data it has found. Any errors will be highlighted in red and accompanied by short explanations on the errors. Note: this tool simply detects all the structured data present in a webpage or code snippet. To check whether such structured data can generate rich results in the Google SERPs, use Google’s Rich Results Test tool. Google Search Console is a powerful tool for keeping tabs on your website’s visibility in the Google SERPs. Be alerted to detected security issues on your website, and more. If you use Google Analytics to track your website traffic, Search Console will also feed data on how you acquire traffic to your Analytics reports. This allows for even more detailed traffic analysis in Analytics! To check your webpages’ Google SERP rankings, you could manually Google your target keywords and look for your webpages in the SERPs. Or, you could let SerpRobot do that for you. Just key in your domain or webpage and up to 5 keywords that you want to check your rankings for. SerpRobot will then return the URLs of your domain that are ranking for those keywords (if any) plus their SERP positions. Instead of SerpRobot, you can also use the FatRank Chrome extension to check a webpage’s SERP rankings. 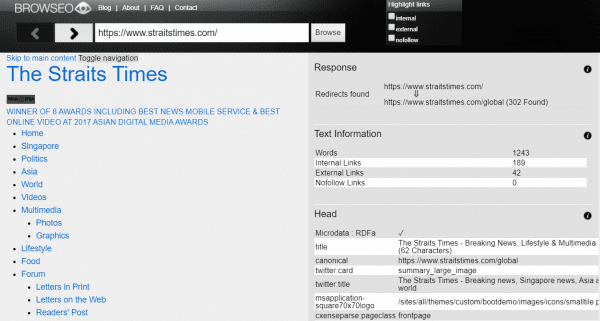 The difference is that FatRank can only check rankings one page and one keyword at a time. First, visit the webpage to be checked in your Chrome browser. This webpage can be either your own or your competitors’. Then, activate FatRank and type in the keyword that you want to check the webpage’s SERP ranking for. If you’re checking multiple SERP rankings for a single webpage in one session, FatRank also allows you to export your findings into a CSV file for further analysis. SerpRobot doesn’t offer this feature. Broken links are bad for user experience and SEO. Use BrokenLinkCheck to scan your website for broken links so you can fix them ASAP. Its free version scans up to 3,000 webpages (no URL limits per page), which should be sufficient for small to medium-sized websites. Apart from telling you which webpages the broken links can be found on, BrokenLinkCheck also provides the source code for such links. This will help you find the links’ anchor texts much quicker, because you don’t have to manually skim through webpages to find them yourself. So, whoever said that doing SEO involves breaking the bank? There are a ton of free SEO tools out there, each of them covering one or more aspects of doing SEO for a website. Try them out to see how they can help your content rank better, and bring in more organic traffic for you! What free SEO tools do you use? Leave a comment! 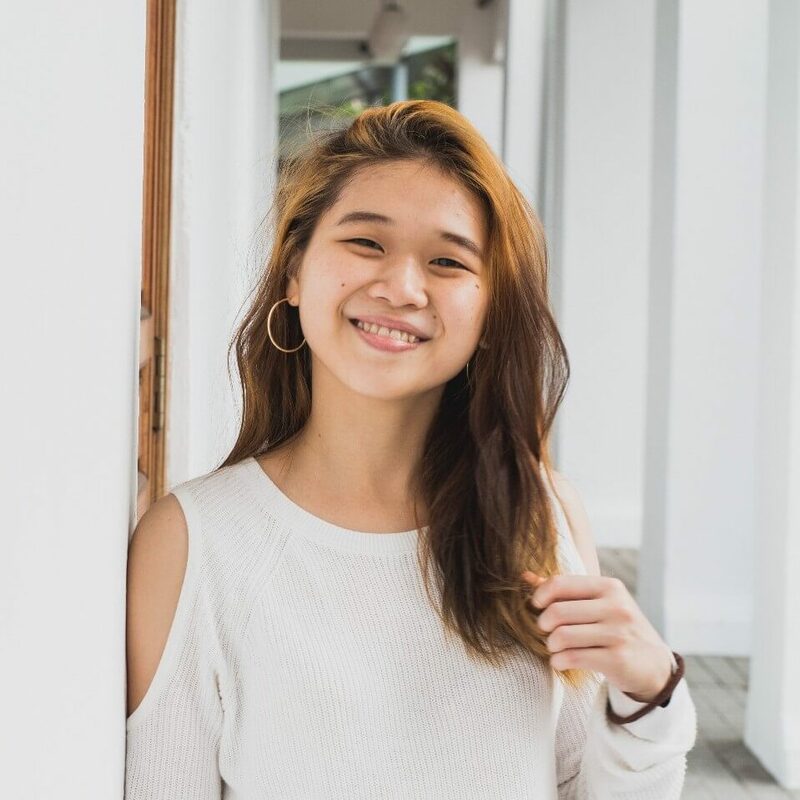 An advocate for self-discovery and doing what you love, Siew Ann founded the lancerX community for freelancers looking to turn their craft into sustainable and meaningful full-time businesses. Siew Ann discovered her passion for digital marketing while in law school and now gets her kicks watching her content rank on Google’s page 1. In this comprehensive SEO tutorial for beginners, I will cover the essential fundamentals of Search Engine Optimization. You will understand SEO better than 90% of beginner internet marketers out there. When you enter a keyword into any search engine, you instantly get results (webpages) that are closely related to or match your search query. To an average user, this doesn’t seem like anything out of the ordinary. But to many businesses, being right in front of their customers every time they show interest in a related product or service can mean big bucks… and I mean steady, monthly recurring income. 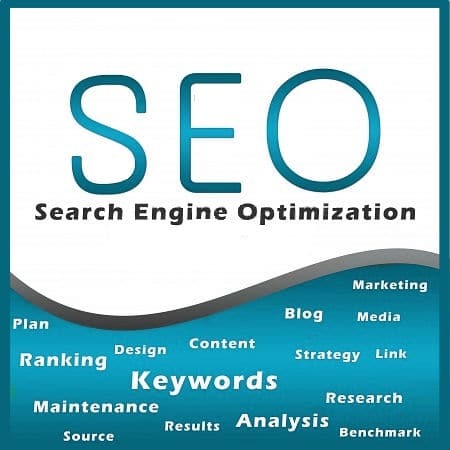 SEO or Search Engine Optimization is the process of optimising a website’s visibility on the organic search engine results pages (SERPs) for a target set of keywords/keyphrases. The higher the position of a webpage on the organic search results pages, the more “visible” the page will be. Search engines use algorithms to calculate how worthy a page is to a relevant search query. There are hundreds of factors (Google uses over 200 ranking factors) that are used to calculate the authority of a webpage, and PageRank (based on a scale of 0 – 10) is one of them. Google assigns PageRank to every webpage it crawls. When another website links to your website, some of its PageRank is passed on to you. The more sites there are out there linking to you, the higher your PageRank will be and the more trustworthy your site will look to search engines. Search engines use bots or “spiders” to crawl billions of pages across the web by following links they find from billions of pages around the web. Search engines then store the information it collects into its index. When a search query is entered, a search engine digs into its index for pages matching the user’s search query, then sorts and displays the most relevant results to the user. The order in which the pages are displayed are calculated by search engine algorithms, taking into account hundreds of ranking factors. Each page is then given a ranking score. In order to rank highly on the search engines, your site needs to score higher than all the other sites that are eligible to show up for a relevant search query. However, be warned that if you engage in shady methods and try to deceive the search engines, you will get yourself burned. Google is very strict on sites that try to manipulate their rankings and if you’re caught doing so, your site will get penalized and removed from the SRPs a.k.a. the “Google Slap”. Every year, Google changes its algorithms some 500 times, that’s 1 – 2 times on average each day. Every once in a while, Google rolls out a major algorithm update, and when they do so, many sites suffer a drop in rankings while many others enjoy a raise in rankings. Lower the rankings of low-quality sites. Decrease rankings of sites that engage in black-hat SEO. Relevancy and knowledge graph update (Semantic search). 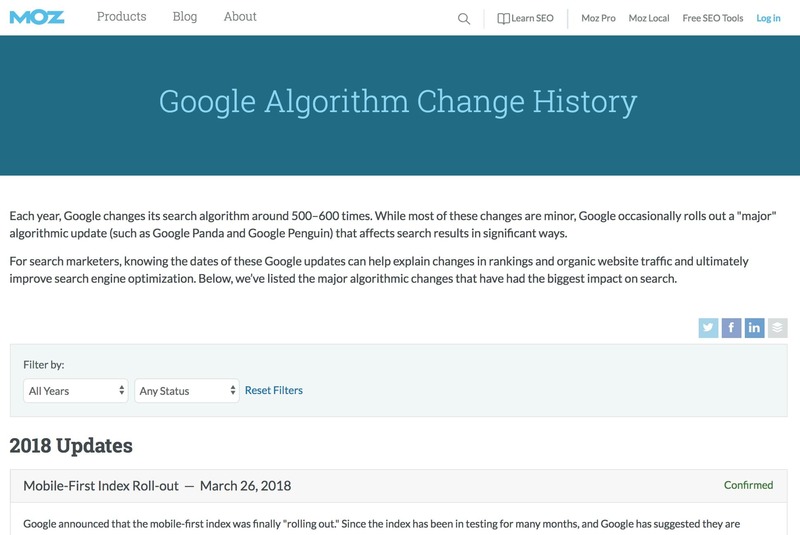 Read Moz.com for more details on the Google algorithm change history. What are some Black-Hat SEO techniques? Cloaking – Displaying different results to search engines and users with the intent of manipulating SE rankings. Mass acquisition of low quality links in a very short period of time. Overuse of keywords in article title and/or content body in a weak attempt to boost rankings for relevant target keywords or keyphrases. View Google’s content guidelines on various link schemes to avoid. How do you do White-Hat SEO? Well, just avoid doing Black-Hat SEO and you’ll be doing White-Hat SEO! We will cover essential on-page SEO such as image optimization, good internal linking structure, quality and uniqueness/originality of the content, and more later on. To give you a better picture of SEO, let’s pretend you’re building a new shopping mall. Before constructing your shopping mall, you first have to take into consideration internal and external factors. Most importantly, you have to take into consideration what makes a great visitor experience. Internally, what is your shopping mall about? Is the theme of your shopping mall unique? Are different shop themes categorized into different levels? Do visitors find it easy to find their way around the mall? Externally, have you taken the steps to put the word out that your shopping mall exists? Is your shopping mall listed in map directories, roadside signboards, or brochure stands in neighbouring malls? If you’ve taken good care of both internal and external factors, chances are your mall will be booming with business. Internally, what is your website about? If you don’t even know what your site is about, it’s very likely search engines won’t as well. Is your site’s theme unique in any way? Search engines love unique content and will reward high quality content. On the other hand, duplicate or scraped content will not do well on the SRPs. Are your content themes properly organized and well interlinked? Websites that have clean site structure with content properly organized into different categories enable search engine spiders to easily crawl through internal pages and index them appropriately. Do users find it easy to navigate through your site? Search engines can detect whether users will find it easy or not to navigate through a site. A well-organized site provides a good user experience, which is precisely what search engines were built for in the first place. 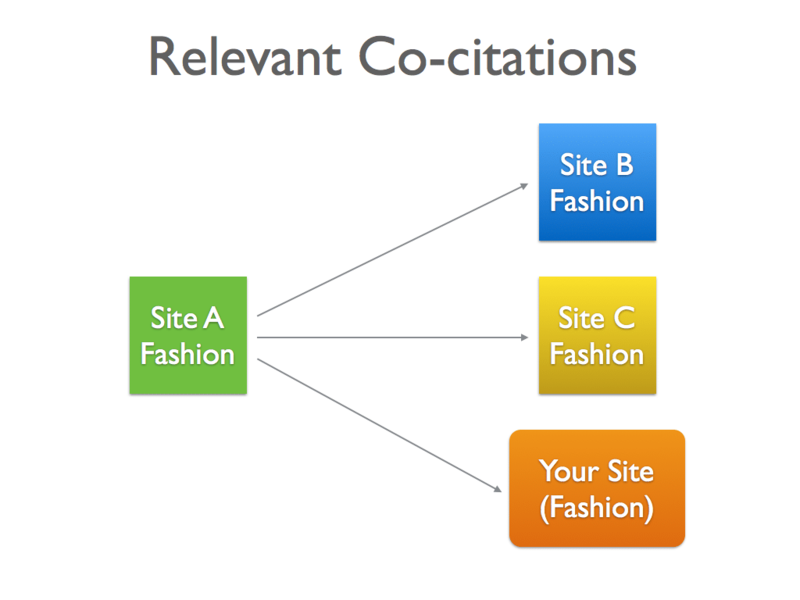 Sites with a clean structure and a clear purpose tend to rank higher on the SRPs. Externally, have you made the effort to communicate with other webmasters in your related niche? Search engines encourage you to actively participate in your community and provide value. Providing value to your community boosts your reputation and increases the chances of attracting inbound links to your site. Are the chances of them linking to your site high? Have you taken the initiative to share your content through popular social networking sites? If your content is interesting, share-worthy, and of high quality, chances are you will attract a lot of inbound links. Do you have a lot of other sites linking to your site, increasing your popularity? The more inbound links (backlinks) you acquire, the more trustworthy search engines will deem your content. If you answered yes to all the above questions, you’re doing great SEO! Search engines were built by humans, for humans. Focus your site on delivering a great user experience and you can rest assure that your site will do well on the search engines. How Can SEO Enhance Your Overall Digital Marketing Strategy? Having good knowledge on the topic of internal SEO and on-page ranking factors will help you better organize your site structure (arranging different categories according to specific themes) to deliver a great user experience, construct a good internal linking structure for better user navigation, and make your site more engaging, resulting in higher conversion rates. Help your customers find you better with local directory listings such as Google Places, Yelp, and Street Directory. 80% of internet consumers in the product awareness stage conduct research online before deciding whether or not to make a purchase. Protecting your online reputation is getting more and more important these days as more and more consumers search for brand names on search engines instead of just entering the direct url i.e. “brandname.com” and the last thing you want them to see is a bad review of your company ranking above your company website. Read: What is an SEO Strategy and Why You Need an Integrated Marketing Strategy? There are 4 main steps when it comes to internal SEO – Keyword Research, Organizing Site Structure, Constructing Content, and On-Page Optimization. Let’s go through each step one by one. When starting out, you want to look out for as many long-tail keywords as you can. Long-tail keywords (more words) are not as difficult to rank highly for as generic keywords (fewer words). Long-tail keywords are also more specific to a user search query and are more likely to result in a conversion. 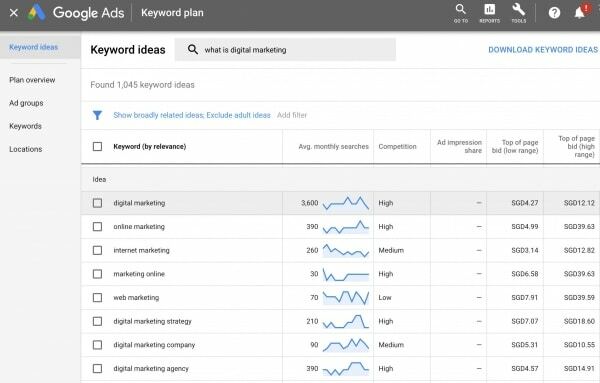 Use the Google Keyword Planner to conduct your SEO keyword research. If you’re building a brand new site, keyword research should be the first thing you do before filling up your site with content. If you’re already running a site, it is also good practice to constantly expand your list of target keywords. Keyword research can help you discover what consumers are actually searching for. When you know what your consumers are looking or asking for, you can better design your content to answer their queries by speaking to them in their language. 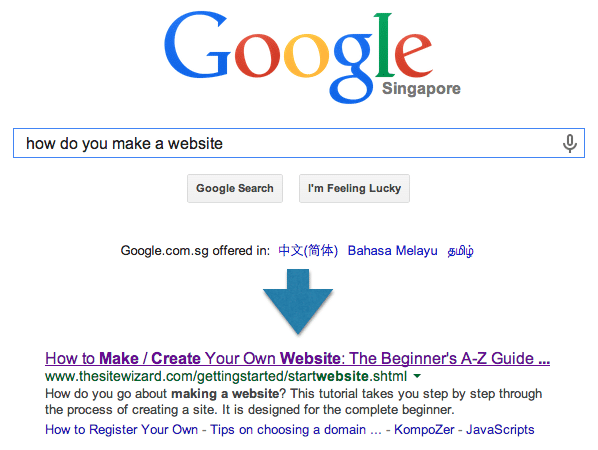 For example if you know people are searching for the exact keyphrase “How do you make a website”, you can create an article titled “How to Make/Create a Your Own Website”. You can develop a variety of content ideas just by going through your list of keywords. You want to build a long list of keywords before you start constructing and organizing your articles. Referencing the above list of keywords, a web design firm will have a good idea of which keywords to optimize for and how to structure their website (SEO Siloing). i.e. If your site is already up and running for some time, you may want to sign up for Google Analytics (if you haven’t already) and check which keywords your current visitors have been using to get to your site. These keywords in your analytics report are likely the keywords that you are already ranking well for, so you want to put more focus on them first. Once you’ve identified these keywords, the next step is to focus your internal optimization efforts on these keywords in the next 3 steps – Organizing site structure, constructing content, and on-page optimization. Remember the shopping mall example? Let’s say you love electronic products and your focus is on building the largest electronics shopping centre in town. If your shopping mall has a specific theme i.e. Electronics Centre and all retail shops in your shopping mall are dealing with electronic goods and categorized into different electronic themes at different levels, as opposed to a generic theme i.e. Downtown Shopping Mall with only a few electronic retail shops, chances are your Electronic Centre will stand out in consumers’ minds whenever they think of buying any electronic products. Similarly, Google and other search engines like Yahoo! & Bing give preference to theme-specific sites when deciding which results to show for a relevant user search query. But if you’ve already built a multi-themed site and want to rank for themed-specific search terms, it’s not the end of the world. Therefore it is safe to assume that you do not need to have only one topic on any one site in order to rank well for a theme-specific keyword. Another scenario would be a box of macarons. 1st Scenario: A box of Green Macarons, Brown Macarons, and Red Macarons mixed together. In this scenario, search engines will likely classify this site as “A box of Macarons”. 2nd Scenario: A box of Green Macarons, A box of Brown Macarons, A box of Red Macarons all separated into different boxes. 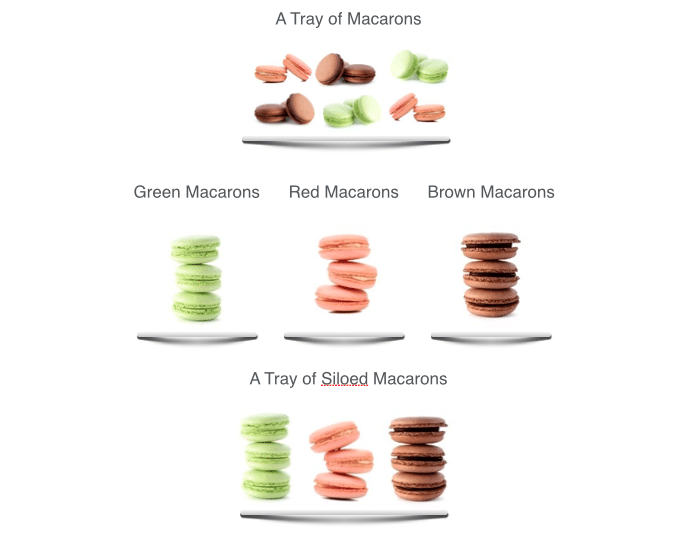 In the second scenario, search engines will likely classify these 3 sites as… A box of Green Macarons, A box of Brown Macarons, A box of Red Macarons. 3rd Scenario: A box of Green Macarons, Brown Macarons, and Red Macarons organized into separate sections. In the third scenario, search engines can clearly distinguish between the 3 different themes of macarons and index them according to their specific themes. So what is a silo in terms of SEO? A silo is a group of theme-specific subjects or topics in a website. What is SEO siloing and why is it important in search engine optimization? SEO siloing is the process of organizing different groups of content topics into specific categories. Much like a bookstore organizing different genres of books into different sections. In terms of SEO, this organizational structure is very important in order for the search engines to understand the theme and intention of your website and rank your site accordingly. There are two methods of SEO siloing. Physical siloing and Virtual siloing. Physical siloing is organizing similar-topic content into similar categories or directories. Much like organizing your computer files into different folders. Virtual siloing on the other hand, is utilizing internal links to relate subject-specific content to one another. i.e. linking from one blogpost to another, whereby both blogposts exist in different directories or categories. 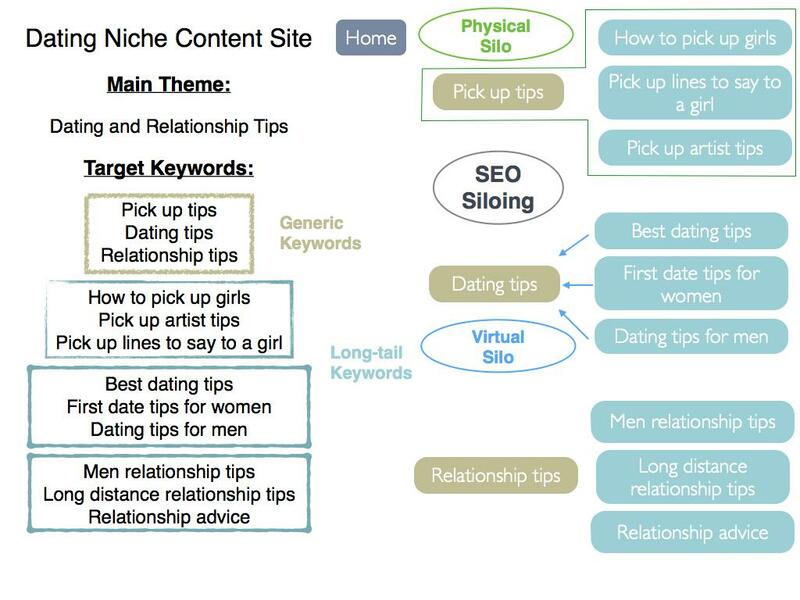 Above example: How a dating niche content site organizes its site structure. You also want to create a HTML or XML sitemap and submit it to the search engines. It’s recommended to include a HTML sitemap for your visitors to refer to and an XML sitemap to submit to the search engines. In order to submit your sitemap to Google, you will need a Google Webmaster Tools account. Landing pages are the pages that your visitors directly land onto when they click on a search result. It is important that your landing pages capture your visitor’s attention and lead them to the inner pages of your site. If your landing page doesn’t answer the search query or isn’t compelling enough and majority of visitors landing on your landing page click the “back” button and go back to the search results, you’d likely see your rankings dipping over time. 1) Plan your article using your researched keywords. 2) Write your article, keeping your keywords in mind. 3) Insert your keywords where appropriate. In the title tag, content body, image alt tags, and subheadings. Once you’ve completed steps 1 to 3, you’re ready for step 4 of the internal SEO process. 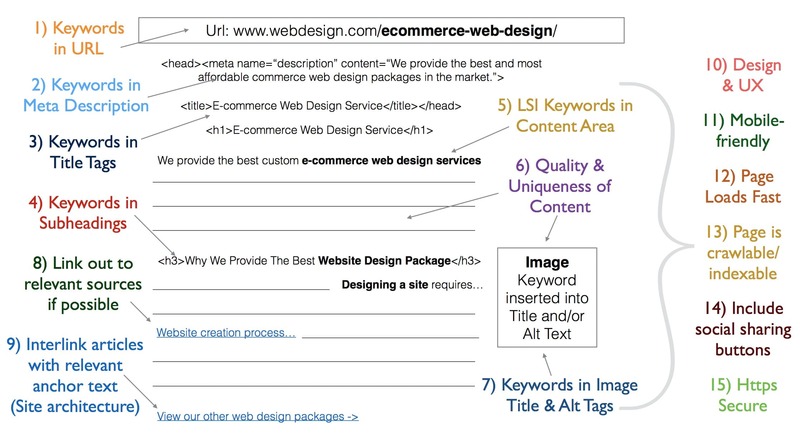 Refer to the above diagram when performing on-page SEO, or SEOgoodguy’s Make a Blogpost SEO Friendly article. Also take note of page loading speed (a ranking factor), as Google is obsessed with page speed. What is external SEO all about? External SEO, more commonly known as off-page SEO is basically link building/marketing – Acquiring the most relevant backlinks from as many relevant high authority sites to achieve and maintain high rankings on the SRPs. A relevant backlink is an inbound link from one of the pages (with relevant meta information such as the title, description, etc.) of another similar-topic website. In order to plan and execute a successful link building campaign for your site, you first need to understand that link building is a long and tedious process. One that requires skillfulness and extensive knowledge on the topic of SEO. However if you persevere, stick to white-hat rules of SEO, animal-proof (Panda, Penguin, Hummingbird) your SEO campaigns by staying updated, you will eventually taste the fruit of success. Before we begin the link building process, let’s first go through and understand some fundamental concepts. A backlink is an inbound or incoming link (hyperlink) to a particular website, referenced from another website. Search engines rely on links to crawl the web and evaluate the authority and relevance of millions of websites. An anchor text is the text you click on that takes you to a referenced url. i.e. (This sentence is an anchor text). It is recommended that the anchor texts of inbound links be diverse (mix of target and non-target keywords, brand mentions, synonyms of target keywords, non-related words, etc.) and not all “exact match” to the target keyword that a site is aiming to rank highly for on the SRPs. A link profile with majority of inbound links that have exact-match anchor texts looks very unnatural, and search engines will devalue these inbound links or even de-index the site. 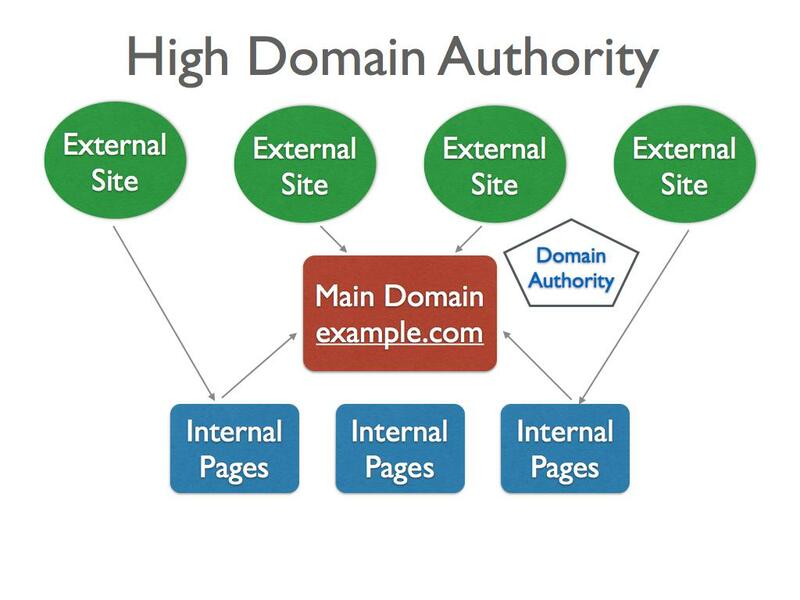 All inbound links pointing to a website’s main domain (www.example.com) as well as its internal pages contribute to the domain authority. Getting a backlink from a high domain authority site is always valuable. Sometimes, that is all you need in order to get on the 1st page of Google for a target keyphrase. PageRank is only one of over 200 ranking factors which Google uses to calculate and decide which page should rank over another. Inbound links pointing specifically to an internal page of a particular website contributes to the PageRank of the specific page. However if a page of say PageRank 6 has two outgoing links, the outgoing PageRank is diluted into half (PageRank 3 each). With everything else equal (i.e. Relevant page title, equal number of backlinks, etc. 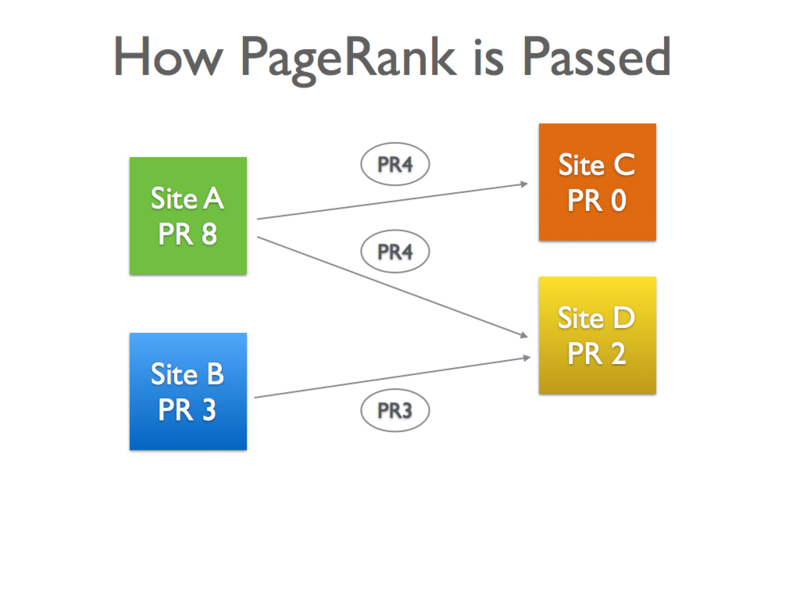 ), a site with a higher PageRank will rank above the site with a lower PageRank. Sites that receive a lot of quality relevant inbound links are more trusted than sites that receive lots of inbound links from low-quality, spammy sites. Getting a link directly from a very trusted site such as Entrepreneur.com will increase your site’s TrustRank tremendously. 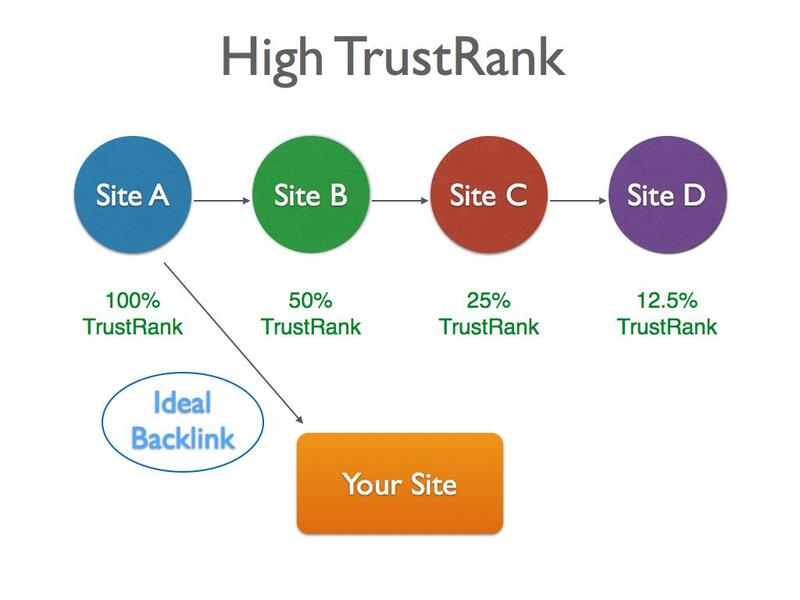 Obtaining a second-tier, third-tier, or fourth-tier link will also increase your site’s TrustRank but the value starts to drop the further it goes. Your website provides financial consultation and you are not able to get a link directly from Entrepreneur.com. However you’re able to obtain a third-tier link from one of the websites that Entrepreneur.com links to. The above figures are made up and only used to demonstrate the point. If you are getting inbound links from an external page (Page A) and it is linking to Page B and Page C which are both relevant to your site’s content topic, this is a strong signal to search engines that your site is relevant to that particular topic. The page title should summarize the page’s content topic. Or rather, the main content topic should reflect the title of the page. Search engines use the page title as an important ranking factor when it comes to displaying relevant search results to the user. Similar to the above Relevant Page Title ranking factor, an inbound link from a page with relevant content topic to your site will increase your relevancy score. The anchor text of a link is another ranking signal that search engines use. The wide-spread belief before the 2012 Google Penguin Update was that a keyword rich anchor text was a strong ranking factor. As a result, many webmasters started over-optimizing their inbound anchor texts by stuffing their target keywords in (exact match), in attempt to manipulate their rankings. Majority of the sites with over-optimized keyword-rich anchor texts who were hit by the update saw a big drop in rankings. Post-Penguin, anchor texts should not be over-optimized. i.e. If you want to rank for “financial consultation”, your anchor texts shouldn’t all be “financial consultation”. There should be a good mix of different types of anchor text. It should sound natural as if someone were to mention your brand name in a conversion. It’s good to have a couple of inbound links with exact match anchor text from high domain authority sites. Just make sure it looks natural and doesn’t make up the majority of your backlink profile. The location of the backlink is also an important factor. A footer link isn’t worth as much as a sidebar link, and a sidebar link isn’t worth as much as an editorial link in the main content section. How long a page has been in Google’s index is also a ranking factor. Creating a website is getting much simpler. There has been an increasing number of fly-by-night sites and many webpages come and go frequently. Therefore the older the page, the more trustworthy it is (provided it is frequently updated). Similarly, the older the backlink, the more TrustRank it gets. Dofollow links are regular links without the rel=“nofollow” attribute in the HTML code and they allow PageRank or Link Juice to be passed on to the linked page. While you’re in the process of acquiring dofollow links, you also want to obtain nofollow links. Although you won’t get any PageRank from a nofollow link, the main reason you also want to include nofollow links in your link profile is that search engines are able crawl a nofollow link and read its anchor text. Even though you don’t get any PageRank flow, you’d still be awarded points for relevancy. Not to mention a link profile with thousands of dofollow inbound links and without a single nofollow backlink looks a little fishy. Basically you want to acquire as many backlinks from other sites that are closely related to the topic of your site and your site’s internal pages. External SEO is basically link building and creating social signals for search engines to determine the authority of your site as well as the context of your site. Here’s a guide to SEO link building you should really check out. Do be careful however not to violate any of Google’s Content Quality Guidelines or participate in link schemes (A.k.a. Black-hat SEO) while in the “joyous” process of link building. As long as you avoid doing any Black-hat SEO, you’re most probably doing White-hat SEO. 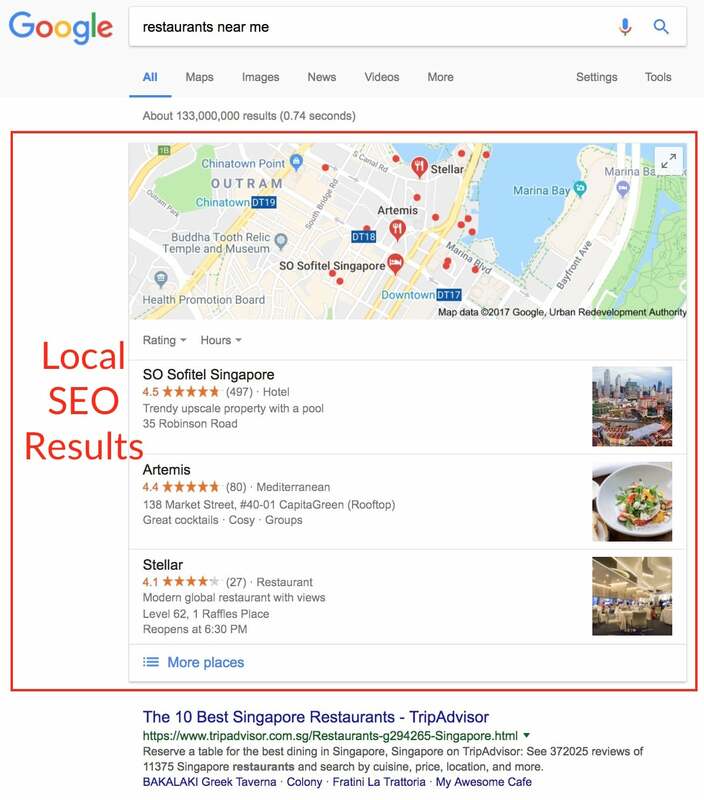 If you’d like to learn practical techniques on how to search engine optimize your website internally (on-page SEO), as well as externally (off-page SEO), you may want to attend our hands-on SEO course in Singapore. I hope this beginner’s SEO tutorial has given you a better understanding on the topic of SEO as a whole. Please leave your comments below and share your link building tips and strategies! Ranking your website on the first page of Google isn’t as straightforward as it was back then (before Hummingbird and RankBrain changed the way Google evaluated and ranked content). Way back in the early days of Google and up till 2012, in order to rank your website prominently on top of the search engines, you just had to include your target keywords in your content (meta tags, headlines, copy, etc.) and get a ton of keyword-rich anchor text backlinks from external webpages (usually spammy article directories) with high PageRank. Try the latter now and risk getting slapped with a manual penalty. Today, you actually need to have solid content that’s extremely useful and relevant for your target ranking keywords in order to nudge your way up to the top of the search results. Stuffing your title tags and content with keywords and building a ton of backlinks alone won’t cut it. With the uprising trend of voice search (approximately 20% of mobile searches are now voice searches), Google has revolutionised the way search engines understand content and deliver search results to users. 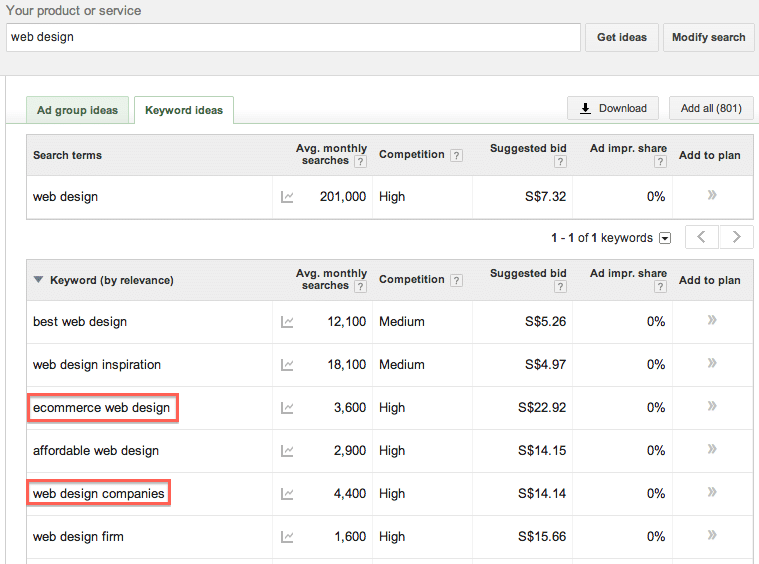 For instance, keywords in the title tag no longer need an exact match to the search query for the page to rank well. In the case of the search query “what do hamsters eat in the wild”, the title tag (in blue) matched only one keyword from the search query – hamster. The rest of the search query keywords were found deep in the content body of the article. Yet, it was still able to rank on the featured answer box on top of the Google search results page. This isn’t to say you shouldn’t still follow traditional SEO copywriting best practices like keyword inclusion (they still work to a certain extent). Rather, you should adopt a healthy balance of writing and optimising content for both humans and search engines. Prioritise for humans however, as search engines were fundamentally built to serve humans and are continuously evolving towards serving humans better. With that in mind, here’s a list of SEO best practices to adopt when you craft your next content masterpiece. The above list pretty much sums up the what you need to do in order to stay on top of Google in 2019. Let’s break down each SEO best practice in more detail. Have you ever clicked on a search result and after skimming through it in the first 10 seconds, found that it didn’t answer your questions and clicked back to the search results page? That’s pogo-sticking. Since RankBrain was deployed, user experience signals have become more and more important than off-page signals i.e. backlinks. As a result, dwell time or the average time users spend on a webpage has been correlated to higher rankings. Meaning, the opposite is also true. If users spent less time on search result A compared to search result B, they most probably did not find search result A very useful. Over time, Google will rank search result B above A. Content uniqueness – ensure your content isn’t copied from elsewhere on the web. If it is ripped off entirely from another publication, Google will consider it duplicate content and it won’t rank well. 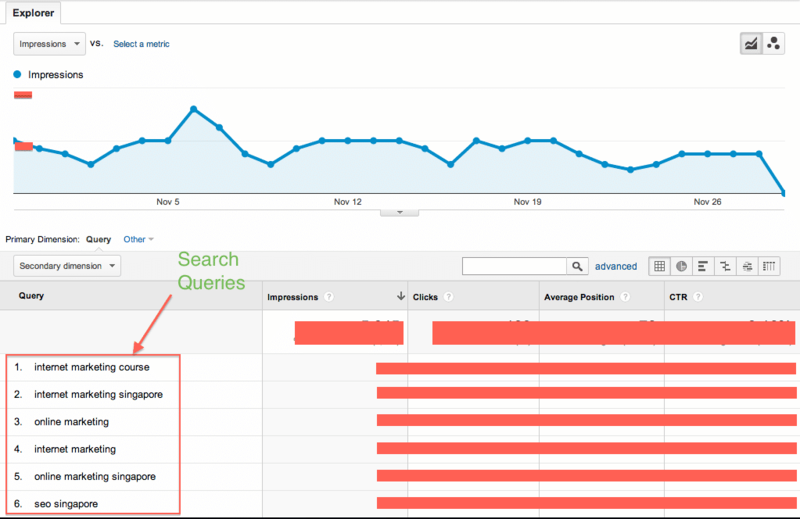 Conduct a search on your target keyword and analyse the top 5 results. Click into each result and digest each content. Then ask yourself, is there any unique value you can add to the question/search query? Can you develop content that’s 10 times more shareable and linkable? Imagine typing in “currency converter calculator” into Google and the first result (like the one below) explains how to use the tool rather than the actual tool for you to use. Though it may be relevant to the query (as in the keywords match), the result may not be relevant to the searcher intent. Most users would skip the first result and click on the tool in the second result like the example below. Note that higher click through rates (CTR) correlate to higher rankings. They would spend more time on the second result (xe.com) since they would be actively using the tool, resulting in a higher dwell time – higher dwell times correlate to higher rankings. However, in the above case, since the searcher is looking for a tool to use, long form content is not an essential ranking factor. In another scenario, if your search query is “how to bake cheese tarts”, the most relevant content formats would be a step-by-step recipe guide and/or a how-to video tutorial. For generic search queries that are one or two words in length, it can be difficult to determine the exact intent. In this case, Google’s Query Deserves Diversity (QDD) algorithm kicks in and returns diversified results. For example, the query “shoes” returns local map search results, a definitive article on shoes, and an e-commerce store selling shoes. Certain queries also deserve freshness (see Google’s freshness algorithm). If the intent of a particular query was, say “taylor swift’s new boyfriend 2018”, an article on Taylor Swift’s new boyfriend in 2017 won’t make it to the top. Take some time to reflect and analyse your target keywords in order to understand the searcher intent. Next, determine the most suitable content format (e.g. video, brand landing page, blogpost, services page, category listing, tool, fresh and up-to-date, etc.). 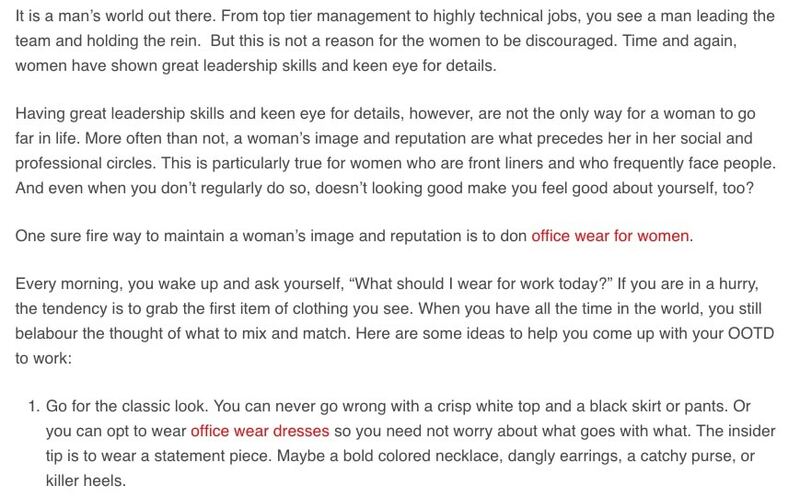 Finally, apply creative copywriting skills to make your snippet enticing enough to click through. Again, with RankBrain as Google’s third most powerful ranking factor, we are seeing single page URLs ranking for more and more similar-themed keywords. For instance, this page ranks for over 157 keywords. 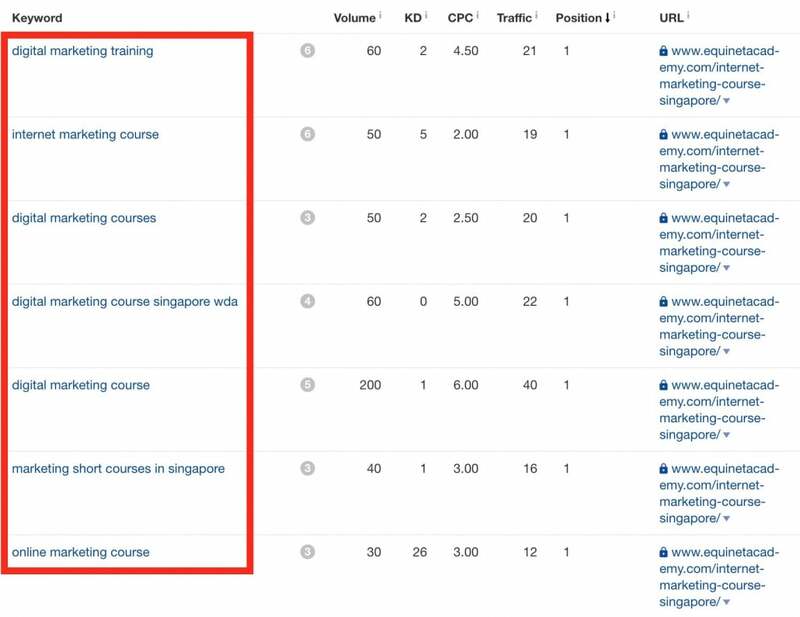 As you can see, instead of creating one page for “digital marketing training”, one for “internet marketing courses”, and another one for “marketing short courses in singapore”, Google recognises the page is relevant for all these terms and ranks the same page on top for all of them. Adopt a systematic approach to your keyword research process to group similar-themed keywords on one webpage. Track and monitor your keyword rankings for the page. If there is a huge disparity in ranking position between the keywords (i.e. one keyword is on position 1 while another keyword is on position 80), then the lower ranking keywords may need to be moved to another page. Yes, this best practice has been around since more than two decades ago. The thing is, it still works. Even though very few voice search results have the exact search query in the title tag, Google still tends to extract voice search answers that match the search query from within the copy. Images also tend to rank better in Google Image search results when tagged with the keywords in the image file name and alternate tags. Google tends to show the written meta description only when the search query is found in it. 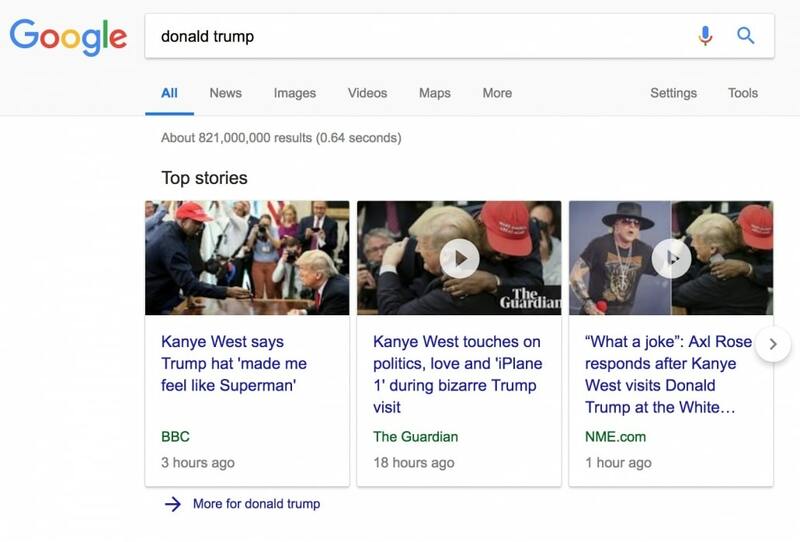 Google works hard to understand the content of a page. You can help Google understand your content better by including structured data on your pages. For instance, if you’re writing an article, you can mark up your content with structured data elements and describe the article or video there. This can help your content gain placement in the Top stories carousel and other rich result features. Check out developers.google.com to identify types of content items that can be marked up. Ever landed on page that took forever to load? You most probably became disinterested and hit the back button after the 6th second. Studies have shown that the probability of a user bouncing off a page increases 106% from 1 – 6 seconds of page loading time. Page speed has also been confirmed as a ranking factor by Google for mobile searches. Check your site with the PageSpeed Insights – Google Developers tool to diagnose slow loading issues such as large CSS files and images and optimise them. Develop accelerated mobile page (AMP) version of your articles. Mobile searches are dominating desktop searches at a rate of over 60%, and it’s still growing fast. If your website still doesn’t load properly on mobile and tablet devices, your mobile rankings will be suffering by now. 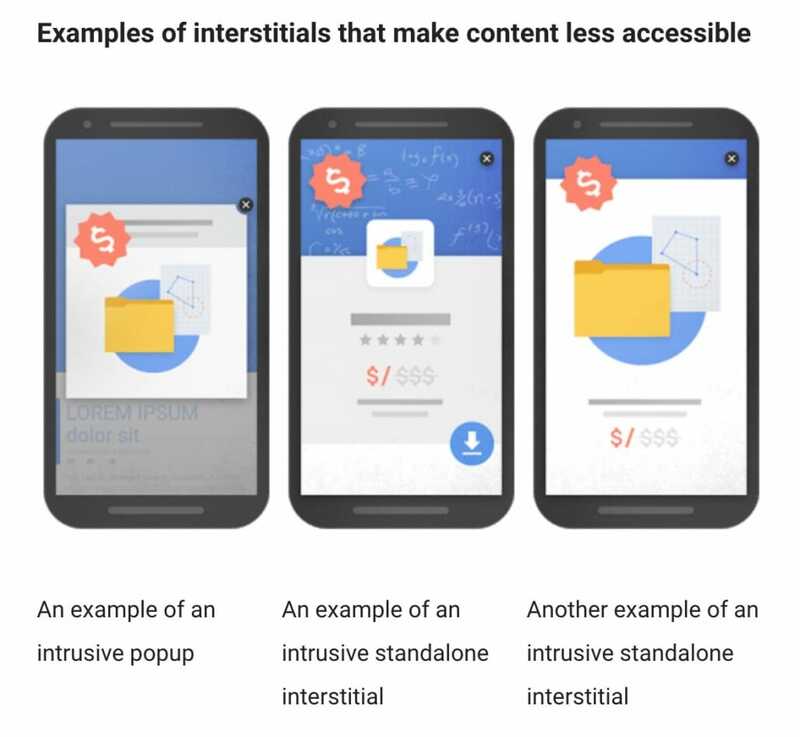 Google has also confirmed the rollout of mobile intrusive interstitials penalty in January 2017. So, be sure to avoid interstitials such as these. Check out whether your pages are mobile friendly with the mobile-friendly test tool by Google. Link your website up with Google Search Console to be notified of any mobile-related design and development issues. Search engine spiders need to be able to access and crawl a page in order to properly index and rank it. Either way, if search engines can’t access or crawl your pages, they won’t rank well. 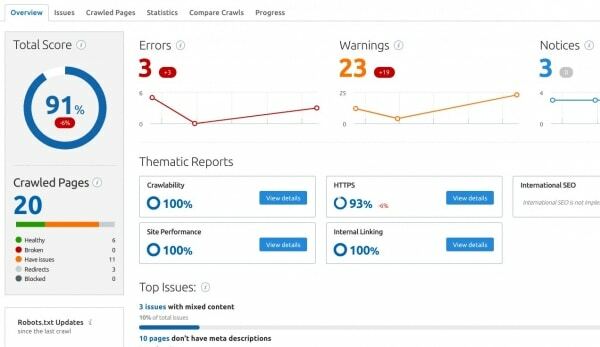 Conduct a full SEO website audit with an SEO auditing tool like Ahrefs Site Audit tool to identify webpages and web resources that can’t be accessed or crawled. Avoid having orphan pages – i.e. pages that have no links pointing to it. Be sure to submit a sitemap to Google Search Console and include more internal links between your pages where appropriate to ensure Google can easily discover them. Google confirmed HTTPS as a ranking signal in 2014. Meaning, websites that have adopted HTTPS will see a slight boost in overall rankings. Contact your web hosting provider or web developer to secure your site with HTTPS. This is the last and one of the most important best practices to follow. As Google relies on off-page signals to determine whether your content deserves to rank (though this factor has been decreasing in influence over the years), if your content isn’t Shareable, Mentionable, or Linkable (SML), it’ll be tough to maintain top rankings, much less rank on top of Google. On the other hand, SML content not only tends to rank much higher, but also continuously earns publicity (in the form of shares, mentions, backlinks) the longer it stays on top. Let’s have a look at an example. A resource page titled “What is SEO” by SearchEngineLand has a clear and comprehensive video explaining what SEO is. The quality of the content alone has allowed it to gradually gain backlinks over the last five years or so. Get 10 people in your industry to read your content and ask them whether they would be open to share, mention, or link to it if there was an opportunity to do so. If the result is 0/10, it might be time to rethink the content. 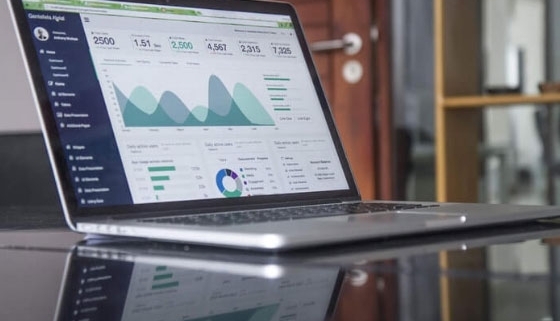 Follow these SEO content best practices to rank well in 2019. Check out my other article on the 22 must-have elements in your blog post, with a bonus template for easy reference. In this article, we will cover what is keyword research, how to conduct it, and how to develop a keyword research document to inform your content strategy and website architecture. Keyword research is finding out what search terms your potential customers are using on search engines, so that you can optimise your website better with the data. It is usually conducted using keyword research tools such as Google Keyword Planner, Keywordtool.io, Ahrefs Keyword Explorer, and Semrush. Curate useful content that hasn’t yet existed on your website: By conducting keyword research, you’ll discover exactly what questions your consumers are asking. The next step would be to understand the searchers’ intents and create relevant content that will provide the best answers/solution to each question/query. Restructure your website architecture: Prior to keyword research, you may have grouped too many unrelated keywords on one page, confusing search engines about the main topic of the page, resulting in subpar rankings. Keyword research can help you group the right keywords into relevant silos i.e. create new pages for new groups of keywords. This enables search engines to understand the main topic of your page better and results in higher rankings. How to Conduct Keyword Research? 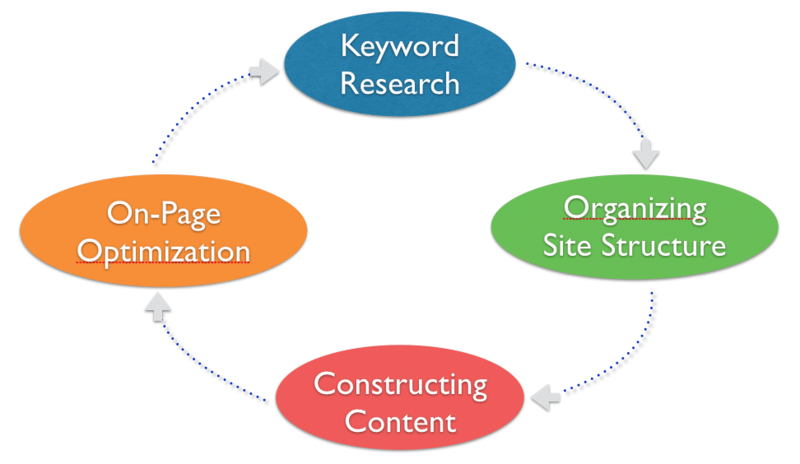 Here’s a 4-step keyword research process we can adopt to conduct keyword research. By the end of this process, you should be able to produce a keyword research sheet. Brainstorming with your team: Setting up a meeting with your team to brainstorm and list down all possible personas. Conducting keyword research: Using keyword research tools such as Google Keyword Planner to identify personas. Analysing existing customer enquiries & profiles: Looking through your past customer enquiries and existing customer profiles to help you identify personas. Conducting market survey: Investing in paid market research data, conducting surveys with 3rd party and existing customers, visiting forums and attending community events where your potential customers hang out. Then, pen down any keywords you think your customers may search with on Google. It can be as simple as this example, e.g. a car rental company. Once you have a substantive list of seed keywords, you can build on/expand your list of keywords in step 2. Keywordtool.io does a great job on building on keyword ideas. Putting all of the above keywords on the same page can kill your rankings for specific search queries i.e. 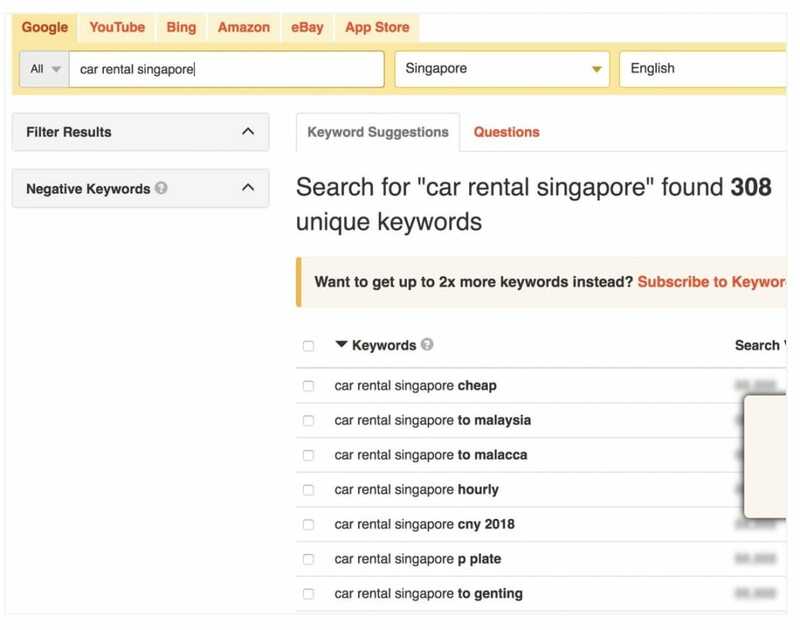 long tail keywords such as “where to rent a car in Singapore”, as Google may get confused about the topical relevancy of your page in relation to your target search queries. You may however get to rank that page for more generic keywords such as “car rental Singapore”. Therefore, if you want to rank for a higher volume of keywords, you need to organise your keywords and pages into silos in step 3. Again, with the car rental company example, we can organise the above keywords with relevant webpages and determine an SEO title for each set of keywords. The SEO title is the text that appears in the headlines of Google’s search engine results. In the keywords column on the above below, we’ve grouped the keywords in relevancy to the SEO titles. In simple terms, the keywords column represents the questions (search intent), and the SEO Titles column represents the answer (web page). The key is to rank a page for as many relevant keywords as possible. In the first row, both keywords have the same intent, in that the consumer wants to find a list of car rental companies. It is still pretty unclear what his exact intentions are as they are still pretty generic. Therefore, the homepage would be a good starting point. In the second row, the consumer’s main concern is the affordability of the car rentals. Therefore, Allstar Cars has curated a list of its cheapest cars into a category page. In the third row, it would be too much of a hassle to create two different pages (i.e. one for daily car rental and one for monthly car rental), especially since the daily and monthly rental rates are also easier for a visitor to view on a single page. Therefore, ranking the same page for both keywords not only reduces time and cost, but also provides a good user experience. In the last row, the intent of the question is to find out or calculate the total cost of renting a car in Singapore. A consumer may be looking for details such as road toll charges, parking costs, insurance, etc. He may not be ready to rent a car yet. Therefore, an informative article (i.e. How much will it cost you to rent a car in Singapore) would be a better search result. Now that we have an organised keyword list with each keyword group mapped to related content, which keywords should we prioritise ranking for? For the search term “Rent a car in Singapore”, the intent to purchase is relatively high. 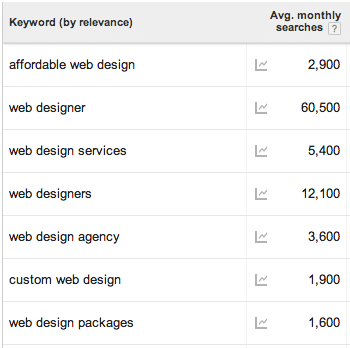 And we can select transactional or product-focused content to rank for keywords like these. For the search term “What are the costs of renting a car in Singapore”, a searcher may not be interested to rent a car yet, and is looking for information on renting a car before making a decision. Therefore, an informative article would be a better page to rank for this keyword. If we had to prioritise which keywords to rank first, we would focus our SEO efforts (i.e. link building and off-page SEO activities) on high purchase intent keywords. It can take months or even years to rank for highly competitive keywords. Therefore, keyword difficulty can be a factor of consideration as to whether you should prioritise ranking a given keyword. There isn’t a foolproof way of calculating exactly how difficult it is to rank for a given keyword (if there was, it wouldn’t be 100% accurate anyway since Google wouldn’t divulge exactly how their ranking algorithms are developed). We can therefore only rely on estimates calculated using tools such as Ahref’s Keyword Difficulty Tool. Though it’s a paid tool, you can conveniently derive a keyword difficulty score, providing you with insight on how difficult it might be to rank for a particular keyword. Other ways to determine keyword difficulty would be to examine whether the competition have thoroughly optimised their pages for a given set of keywords. If you discovered a long tail keyword that no one has optimised for, it shouldn’t be too difficult to rank for it. A straightforward example would be brand names e.g. Allstar Cars. Although the search volume is less than 10 every month, it can still drive high quality traffic and conversions. If the above two factors are equal, then search volume would be the deciding factor which keywords should have priority in ranking. We can check the search volume of a keyword on Google with Google Keyword Planner. 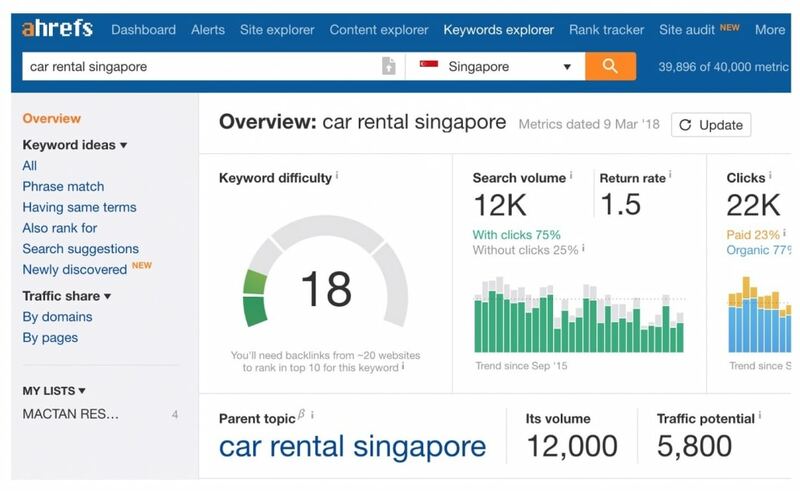 As you can see, car rental Singapore has a higher search volume than cheap car rental singapore. 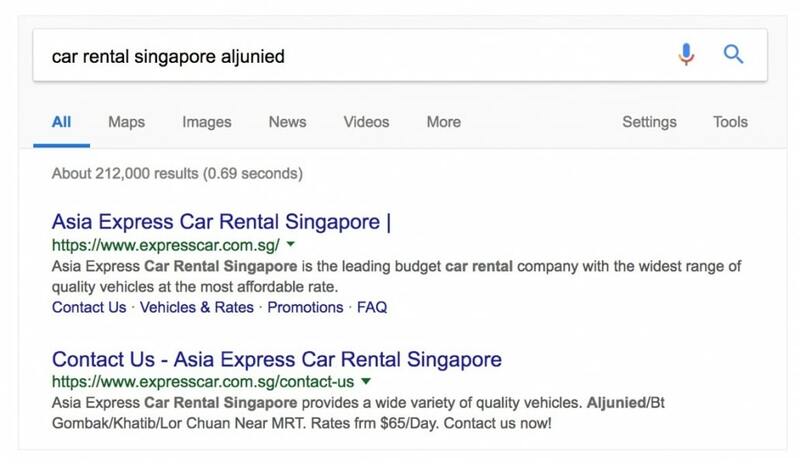 If cheap car rental singapore were as competitive as car rental Singapore, we would then prioritise ranking for the higher search volume keyword which would be car rental Singapore. Keyword research can be a tedious process and take weeks or even months to execute. But it creates a strong foundation for your on-page SEO activities and can provide insights on customer intent and behaviour. The 4-step keyword research process streamlines your keyword research activity and enables you to perform effective and efficient keyword research. I cover more in-depth keyword research techniques in my 2-day Search Engine Optimisation course. Get hands-on and sign up to learn how to rank your website on top of Google. All the best! Why You Need an Integrated SEO Marketing Strategy? An SEO strategy is a blueprint or master plan to achieve top organic search engine rankings and visibility for a brand. As this is an intermediate to advanced level article, I recommend reading this beginner SEO guide first if you’re relatively new to SEO. To achieve optimal results in the long term, an SEO strategy should also be integrated with, and complement other channel marketing strategies, particularly content marketing, search engine marketing (SEM), social media marketing, Online PR, and digital advertising. In this article, I’ll break down why and how an SEO strategy should be integrated with other channel marketing strategies. It is common to think that the main objective of a successful search engine optimisation campaign is to achieve high rankings for a carefully selected group of keywords. But is it really the case anymore? As search engine algorithms constantly evolve, ranking number one for every keyword you target is becoming a seemingly impossible task. On a side note, if an SEO agency promises/guarantees you number one rankings, there’s a high chance they might engage in search engine spam techniques which can do more harm than good, so veer far away. Your objectives and tactics in your SEO strategy should align with other channel marketing strategies’ objectives and tactics. The key to a successful integrated SEO strategy is to understand what a successful SEO campaign can bring to the table and how to effectively integrate various channel marketing strategies (such as content marketing, social media marketing, and digital advertising) to achieve common objectives (e.g. increasing brand awareness, engagement, and sales). Increase in brand awareness – by ranking for top of the funnel keywords searched by your target audience. Examples of top of the funnel keywords for an electronics retailer include more generic search terms such as “electronic products” and “electronics stores”. Increase in engagement (e.g. traffic and time spent on site) – by ranking for relevant search terms potential customers may use along their buying journey and making sure the content that ranks actually influences their buying decision. Increase in sales – by ranking for bottom of the funnel keywords where potential customers are more ready to commit to a purchase such as “buy ssd drive for macbook pro” and “cheap ram ddr4 16gb”. As you may have already noticed, the above objectives are very similar to almost any general marketing strategy. How then, are you supposed to integrate other channel marketing strategies with your SEO strategy? First, you need to understand what an integrated marketing means. Here’s an excellent definition taken from thedma.org – Integrated Marketing is an approach to creating a unified and seamless experience for consumers to interact with the brand/enterprise; it attempts to meld all aspects of marketing communication such as advertising, sales promotion, public relations, direct marketing, and social media, through their respective mix of tactics, methods, channels, media, and activities, so that all work together as a unified force. It is a process designed to ensure that all messaging and communications strategies are consistent across all channels and are centered on the customer. Second, if you’re attempting to meld the various aspects of marketing communication into a unified force, you need to be proficient in or at least sufficiently familiar with the pillars, tactics, and benefits and constraints of other channel marketing strategies. In other words, you need to be a T-shaped marketer. Let’s say you want to increase brand awareness through content marketing. A well-executed, standalone, content promotion campaign such as getting influencers to review your products and link to your website will achieve that objective. Speaking about unified force, the backlinks acquired from the influencer’s blog or website will also increase your keyword (SEO) rankings. Adding to this point, in order to rank and stay on top of the search engines in the long term, you need a constant influx of backlinks. And to achieve that, you need a robust content marketing strategy, one that will consistently earn you natural backlinks. 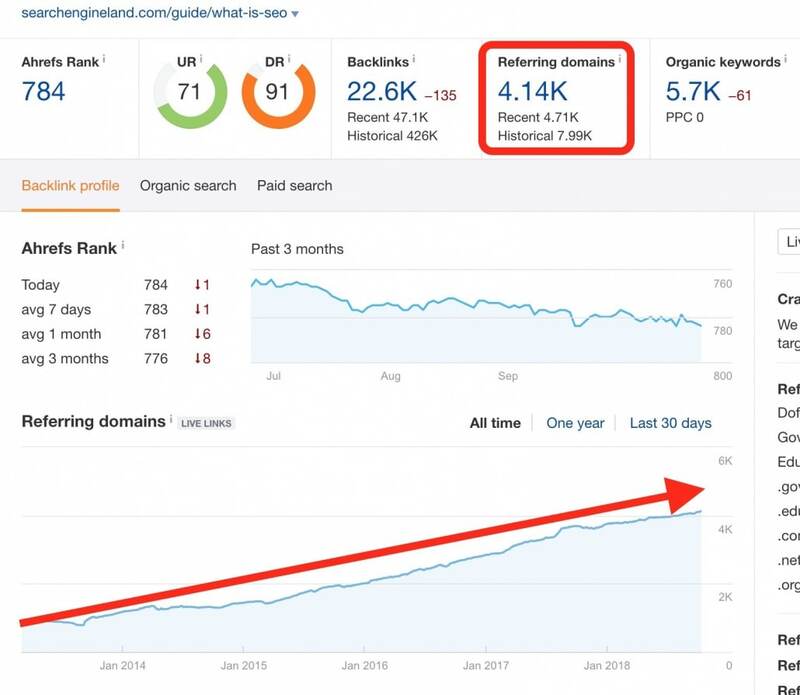 Here’s an example of how an integrated SEO and content marketing strategy produced a well-thought-out and well-crafted content piece that generated thousands of backlinks for Moz and positioned them as the authority of their industry. Moz knew the search term “google algorithm change history” was a popular search term that would bring a good amount of regular traffic and wanted to capitalise on that. They also knew it was going to be a content piece that SEO bloggers would likely link to in the long run, as it would be an incredibly challenging task to maintain its freshness, much less to create and organise the entire timeline of Google algorithm changes. 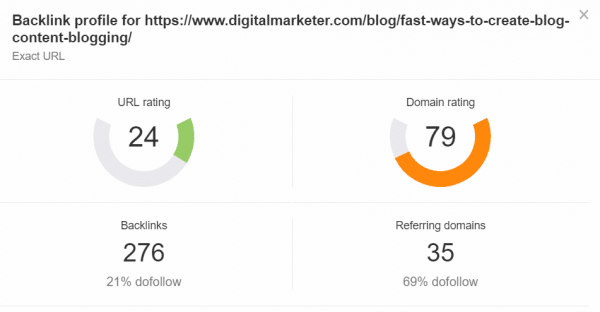 After a good initial content marketing campaign boost and some basic SEO on-page keyword optimisation, the page initially gained backlinks from 514 websites. But it was enough to rank it on the 1st page of Google. And as SEO bloggers wrote SEO content that talked about google algorithm changes, they Googled for sources like this and eventually linked to Moz’s. Using Ahrefs’s Site Explorer tool, we can see that over the past 5 years, it has generated backlinks from over 5000 referring domains! Not only did the tremendous link equity to the Moz domain boost its overall keyword rankings and increased brand awareness, engagement, and sales, it also helped position Moz as the authority in the SEO industry. At Equinet Academy, we integrate SEO into every other channel marketing strategy where possible. The reason why we’re so invested in SEO is due to the positive results the organic search channel has brought us over the years. As you can see in our Google Analytics Multi-Channel Funnels report above, the organic search channel contributed to 34.76% of assisted conversions and 37.42% of direct conversions. That’s more than one-third of all sales, leads, and engagements. In conclusion, if you do your best to integrate SEO across your various channel marketing strategies, you will gradually see a consistent growth in traffic, engagement, and leads. 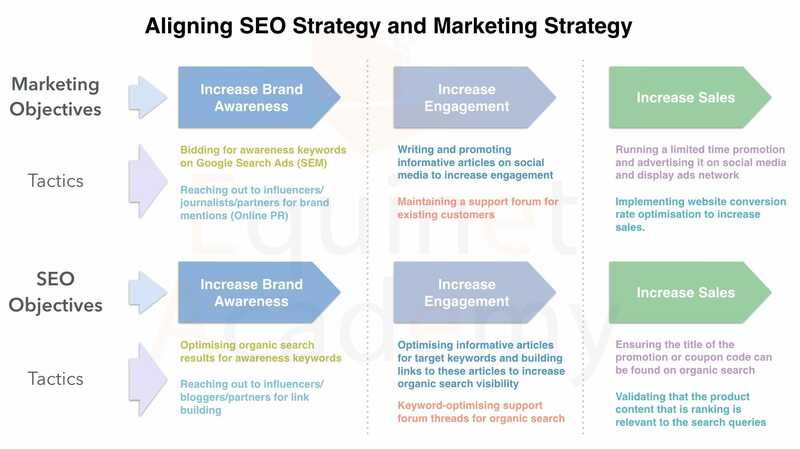 https://www.equinetacademy.com/wp-content/uploads/Aligning-SEO-Strategy-with-Marketing-Strategy-Diagram.jpg 930 1656 Dylan Sun https://www.equinetacademy.com/wp-content/uploads/2016/02/EA-Logo-White.png Dylan Sun2018-07-22 10:14:182019-03-04 16:13:00Why You Need an Integrated SEO Marketing Strategy? SEO, SEM, and PPC. These terms have been used interchangeably for the longest time. But are they really the same? This article aims to iron out the definition of each discipline and provide you with a clearer understanding on the features, differences, pros, and cons. What is SEO and SEM, and What is PPC Exactly? SEO or Search Engine Optimisation is the process of optimising a website to rank prominently on the organic search results. SEM or Search Engine Marketing is a subset of digital advertising, associated with targeting a website to rank on the paid search engine results pages. PPC or Pay Per Click refers to the buying model in which advertisers pay a fee for every click their ad receives. Based on the above definitions, SEO and SEM both exist within the umbrella term “Search Marketing”. 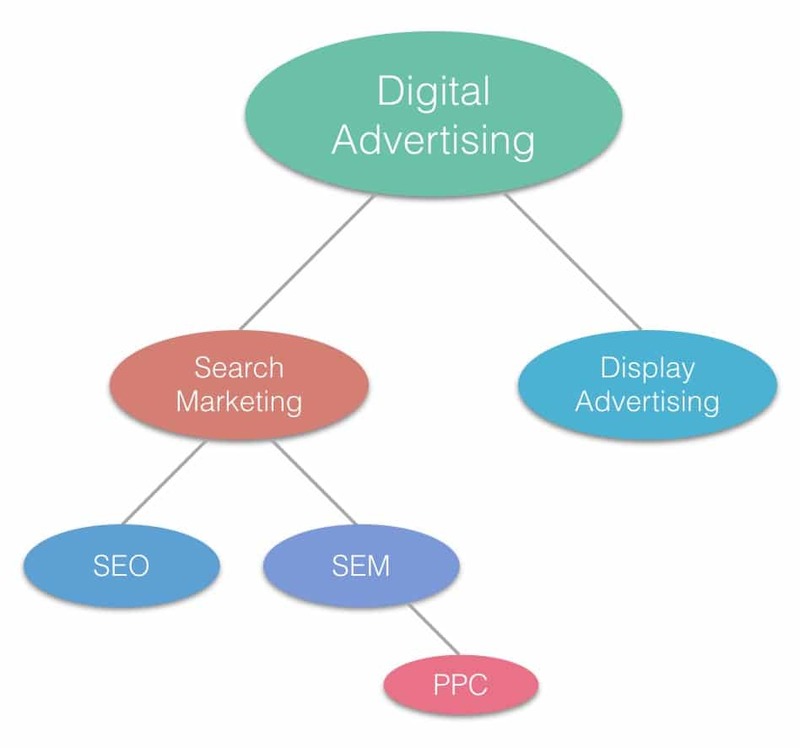 And while PPC is a buying model which is commonly and inaccurately used interchangeably with SEM, it isn’t wrong to say that SEM and PPC co-exist within the same subset of Digital Advertising – Search Advertising. The main difference between SEO and SEM is that SEO is a method of ranking a website on the organic search results while SEM is based on a pay per click model of displaying text ads above the organic search results. To better illustrate this, let’s put on the hat of a Marketing Executive of a B2B organic food supplier. Your clients are looking for products like yours on Google and they’re typing in search terms such as “organic food”. To be visible and potentially acquire clients at this crucial moment, your website needs to be ranked highly on the paid search results, organic search results, or in the best-case scenario, BOTH. To rank on the paid search results, you set up your ads and target keywords on Google AdWords. Within a day, your company website ranks on the top 4 positions of Google whenever a potential client searches for your target keywords e.g. “organic food suppliers”. However, you have to pay Google AdWords a fee every time a user clicks on your ad. That’s because Google AdWords charges advertisers based on a pay per click or PPC model. After evaluating your costs vs results, you realise you may not be able to maintain your budget for the long term as more and more competitors bid and compete for the same target keywords. You decide to invest in an SEO strategy to rank your website on the organic search results instead, where clicks don’t cost you anything. We know that both SEO and SEM are subsets of search marketing that co-exist in the same channel of search. We also know that we have to pay a fee for every click for SEM traffic while we pay nothing for clicks from SEO efforts. 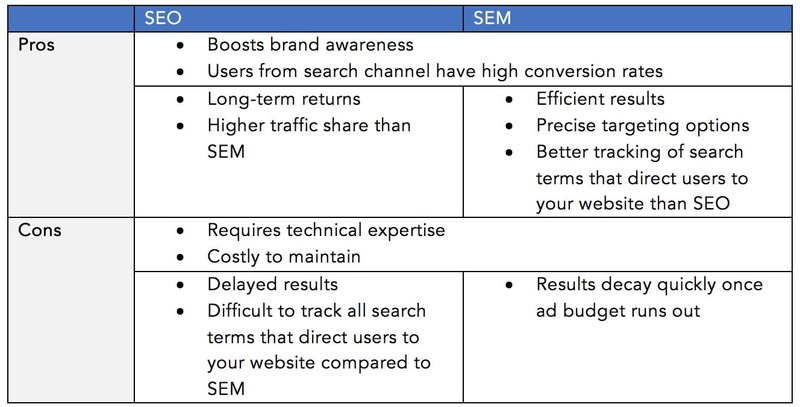 With that said, here’s a list of similarities and differences between SEO and SEM. The pros and cons of SEO and SEM, as outlined in the comparison table below. People become more aware of your brand when they see your website ranking for multiple search terms, even if they don’t click into it. Traffic acquired from the search channel tend to have higher conversion rates, as search is an intent-based marketing channel. SEO may not be very effective in the short term but it boosts long-term returns, and SEO efforts can take anywhere from weeks to months to see visible results. Once you’re ranked high organically, you’ll be up there for a good amount of time. This isn’t the case for SEM as your ads will stop showing the moment your ad budget runs out. Organic search results also tend to get more clicks than paid search results, but it depends on the industry and specific search terms that are used. With SEM, however, it can take less than an hour to set up a Google AdWords campaign and start driving traffic. That’s as fast as launching a makeshift lemonade stand along the street. You also get more precise targeting options such as choosing what time and day to show your ads, which countries you want your ads to appear in, and which position you want your ad to rank. On top of that, you’re able to track exactly what search terms were used to get to your website from Google (You get limited data from the organic search results). 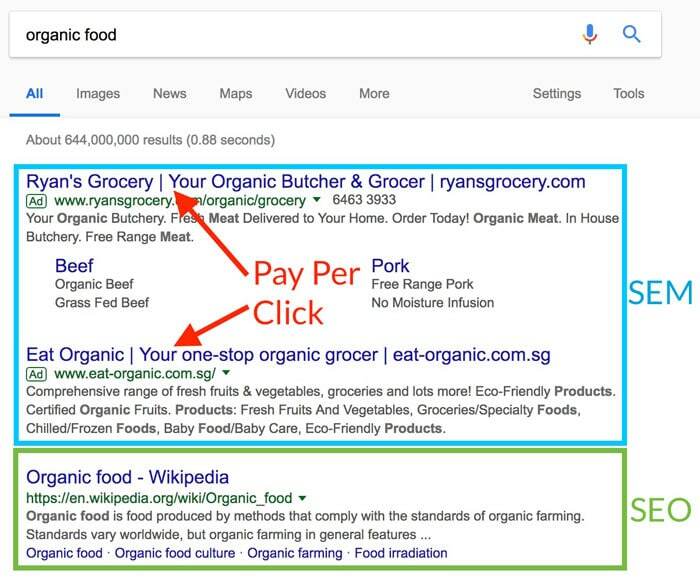 For example, if you targeted the search term “organic food Singapore” and a user typed in close variant “organic foods Singapore”, you’ll be able to see the plural form in your reports as well. Both SEO and SEM require technical and platform expertise to outperform your competitors and generate a positive ROI. This means it can be difficult and costly to hire in-house specialists to execute and oversee your campaigns. Because of this, the option of hiring a digital marketing agency is a rather popular choice for marketing departments. Should You Do SEO or SEM? It depends. Ask any digital marketing expert, and he or she will advise you to run both SEO and SEM campaigns if you have the sufficient required marketing budget. However, there are several factors that could affect your decision whether to do only SEO, SEM, or both. Short customer lifecycle: If you’re launching a promotional product marketing campaign with a short buying cycle i.e. 1 month, you won’t have the time to wait for your SEO efforts to boost your website to page 1. You need to execute an SEM campaign and get on top of the search results pages asap. You want to maximise traffic from the search channel: Studies have shown that ranking on both the paid and organic search results pages result in incremental clicks overall. In this case, you want to run both SEO and SEM campaigns simultaneously. Competition on paid search is over the roof: If a click costs you $58.64 and your profit margin is negative, you shouldn’t be doing SEM unless you’re okay with donating to Google. You want to test the market: Since SEM can get you visibility very quickly, you can test which keywords convert better. After analysing your performance, you can then direct your focus to keywords that convert better in your SEO campaign. There are many factors that could affect your decision whether to run SEM, SEO, or both. Take the time to analyse your industry and make a decision driven by data, not guesswork. If you want to learn how to improve your organic search engine rankings via SEO, check out our hands-on SEO course. If you need to quickly generate search traffic and can’t wait six months or longer for SEO to take effect, SEM may be a better choice. In this case, our Google Ads course covers how to set up an Google SEM campaign from scratch. Should the old site still be accessible to the public when the new site goes live? What impact would that have on the rankings of both sites? Which pages should be removed completely and which pages should be redirected to the new versions? What could be done to minimize any negative impacts on existing search engine rankings? Content from the old domain was uploaded to the new domain. An Excel document directing the mapping of old page URLs to be redirected to the new domain’s URLs was created. Sitemap of both old and new domains were submitted to Google Search Console. Redirects were implemented by the technical web development team, shutting down the old site. A change of address form was completed in Google Search Console. Imagine you run a fast food joint in a shopping mall and you’re paying $5000/month in rent. The foot traffic is good. But you’re located at a blindspot, so you’re barely breaking even. If this goes on month after month, you’ll probably need to close down. One day, the mall announces to all tenants that they are offering “free” rent to limited food joints at a high traffic location, provided they prove that they are able to attract more shoppers. The mall puts a few candidates, including you, at the entrance of the mall. Since your fast food is so delicious and you provide free food sampling, it attracts long queues and this in turn attracts passersby to walk into the mall. After a short trial period, the mall rewards you with that spot, rent free! That’s right. $0/month for a high foot traffic location because your food is so darn good. It’s a win-win – you get thousands of foot traffic per month at no cost because the shopping mall is able to attract more shoppers. Google works in similar ways. SEO or Search Engine Optimisation is the practice of increasing a website’s visibility on the organic search engine results pages. 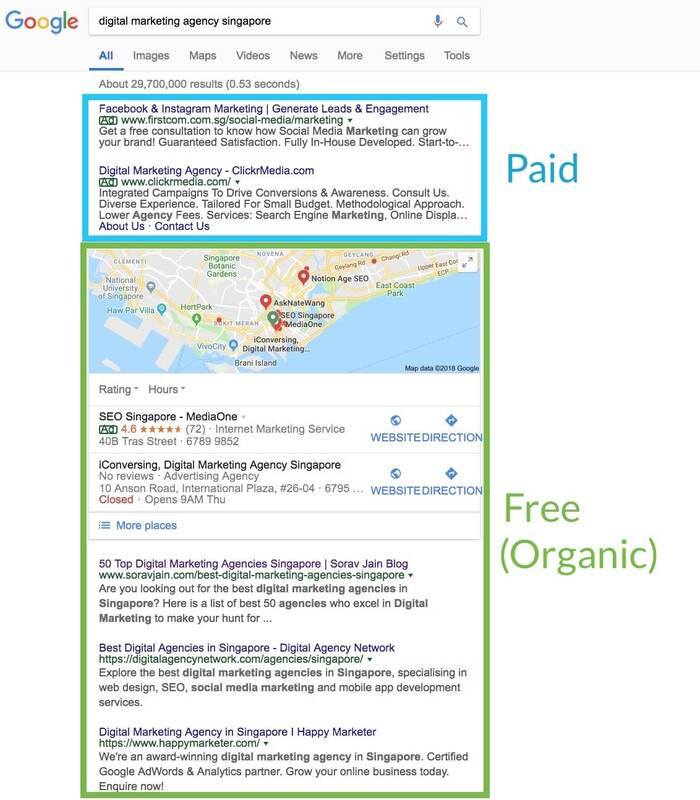 Every time you perform a search on Google, Google returns two types of search results – The paid search results, and the organic search results. But first, how does Google return over 29 million results for one search query? How do they even discover the billions of webpages on the internet? One of the ways Google achieves this is by sending out robots a.k.a. search engine spiders to crawl the web. 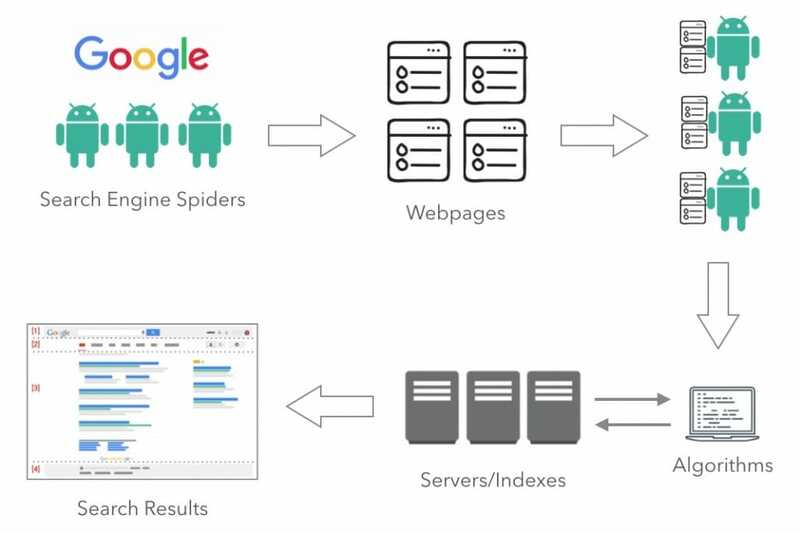 When a search engine spider crawls a webpage, it downloads the content and stores it in Google’s indexes (huge gigantic servers that store and retrieve data). So, before you can even rank anything on Google, the first thing you obviously need is a website. Similar to the shopping mall example earlier, as there are thousands of other websites out there trying to rank their webpages on Google as well, Google has to decide which webpages deserve to rank on the top. Google achieves this through creating and implementing algorithms to sort the rubbish from the ones that actually provide value to the searcher. These algorithms make up to over 200 ranking factors that are taken into consideration. SEO can help you maximise your customer touch points, increasing the chances of sales – it takes 6 to 8 touch points to generate a viable sales lead. In Singapore, Google has over 90% of marketshare among other popular search engines such as Bing and Yahoo!. As such, we will be focusing on Google SEO in this article. Keywords, sometimes referred to as search terms, search queries, and key phrases, are the foundation of Search Engine Optimisation. Take away this element and search engines become redundant. Keyword research is the process of selecting keywords based on market research (e.g. using a keyword research tool such as Google Keyword Planner, analysing existing keyword data via a web analytics software) to optimise a website’s search engine rankings for. Once you have chosen your target keywords (i.e. built your keyword list), the next step is to populate your website with the selected keywords. 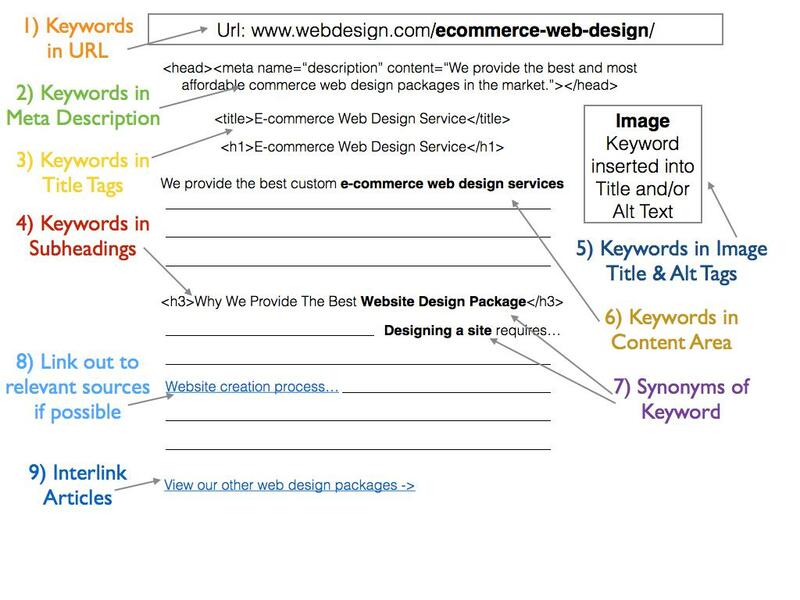 Some activities of non-technical on-page SEO include inserting keywords into editorial copy, tailoring content to satisfy the intent of the searcher, and organising website content architecture in a silo-ed fashion to deliver a good user experience (in terms of navigating around your website). For technical on-page SEO, some of the activities include modifying webpage meta tags (e.g. title tags, meta description, and rel canonical tags), developing mobile-friendly pages with AMP content, implementing SEO-related markups (e.g. Schema.org markup, rel=nofollow, and rel alternate hreflang), and dealing with duplicate content (e.g. rel canonical tags, redirect, and noindex). Basically, both technical and non-technical on-page SEO aim to make a website search engine friendly, which increases the chances of it ranking higher on the Search Engine Results Pages (SERPs). All the above off-page activities come down to establishing an online brand presence, which boost brand recall and build backlinks to a website. And we all know that backlinks play a major role in influencing a website’s search engine rankings. Local SEO refers to the practice of boosting the visibility of a local brick and mortar business’s listing on the local search results. Local citation building: Submitting your company details (business name, address, phone number) to local business directories. Garnering reviews: Getting your customers to leave reviews on your Google MyBusiness page. International SEO refers to the practice of optimising a website to increase its global presence on international search engine domains. It involves segregating content by language and currency (if applicable), based on various target audiences, into different country code top level domains (CCTLDs), subdomains, or sub directories. For example, an online fashion retailer e.g. www.fashionxyz.com may want to expand its international search presence to Australia and Japan. 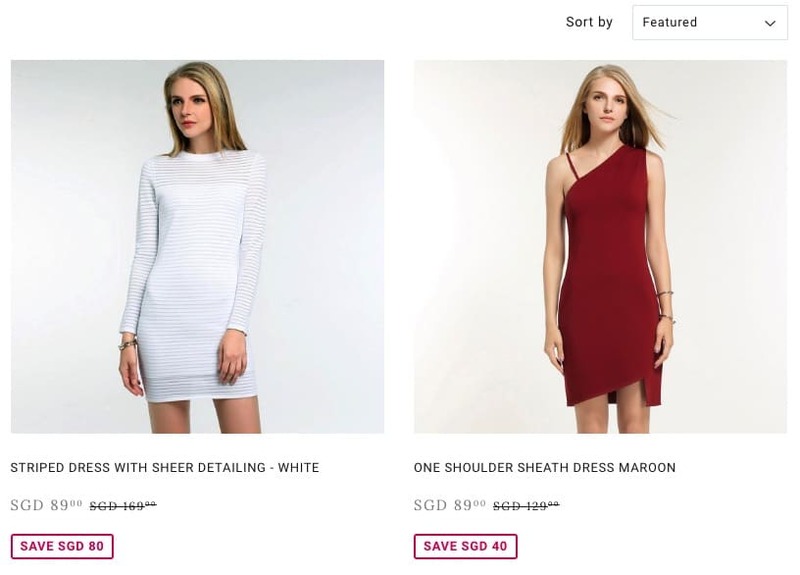 It creates two new websites on the CCTLD domains www.fashionxyz.com.au and www.fashionxyz.jp and tailors its content to the local languages of both countries. This helps Google and other search engines to rank the correct version of the website in the right country. If you found this post helpful, you may also find the following resources helpful in furthering your SEO knowledge. https://www.equinetacademy.com/wp-content/uploads/SEO-Earned-Media.jpg 1210 1392 Dylan Sun https://www.equinetacademy.com/wp-content/uploads/2016/02/EA-Logo-White.png Dylan Sun2017-12-15 04:53:082019-02-14 15:17:12What is SEO and How It Works?